Front to back – Emily Lysakova (class 2021), Nicholas Ring (alumnus class 2018) ,Jonah Florholmen-Bouman (class 2020) calibrating a fathometer to measure the depth and change of a sand quarry off the coast of Staten Island in a joint project between New York Harbor School’s Harbor SEALs and SUNY Stony Brook with Professor Henry Bokuniewicz (Photo credit: Mauricio González). SAVE THE DATE: May 15 we will host our 8th Annual Marine Science Symposium at the New York Harbor School. We have the privilege to present as our guest speaker Ms. Rachael Miller, Director of the Rozalia Project and one of the pioneers in ocean plastics research. The Fall Semester of the 2017-2018 school year has been another successful season for the Marine Biology Research Program (MBRP) and the Harbor SEALs in particular. We began the year with a recruitment campaign for the new cohort, led by our junior and senior leaders, which managed to attract and retain over 25 team members. For those of you unfamiliar with after school science clubs, this is an impressive feat. Next, our grant proposal to ConEdison was successfully submitted and rewarded, with the help of Matthew Haiken from the New York Harbor Foundation. 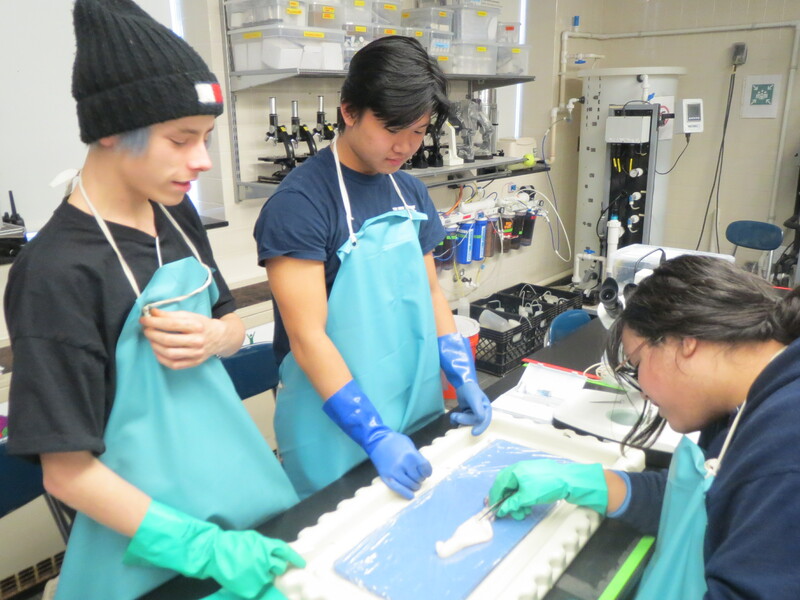 Funds from this grant have allowed us to run our ambitious STEM program preparing the next generation of marine scientists. They also benefit the various animals we house in our Recirculating Aquaculture Systems (RAS) including Valrie and Amaya, Red-Eared Slider turtles and hundreds of tilapia. Next, we initiated a special collaboration with one of our professional partner organizations, SUNY Stony Brook, to monitor an underwater sand quarry in the Harbor originally dug out decades ago to provide sand for major construction projects around NYC. Our students plan on compiling and comparing spatial-temporal data to discern changes in sedimentation that may have occurred over time. In November we celebrated our 8th annual Harbor SEALs-giving with scholars, alumni, colleagues, and friends. Next year we plan on hosting an alumni after-party in lower Manhattan. December was a busy month during which we convened our Professional Advisory Committee, I took a Master Class on the history of Eugenics run by Dr. Allen Spiegel, Head of Einstein’s School of Medicine, and visited ConEdison’s Learning Center in Queens with our senior research scholars thanks to an invitation by our PAC member, Michael Kessler. 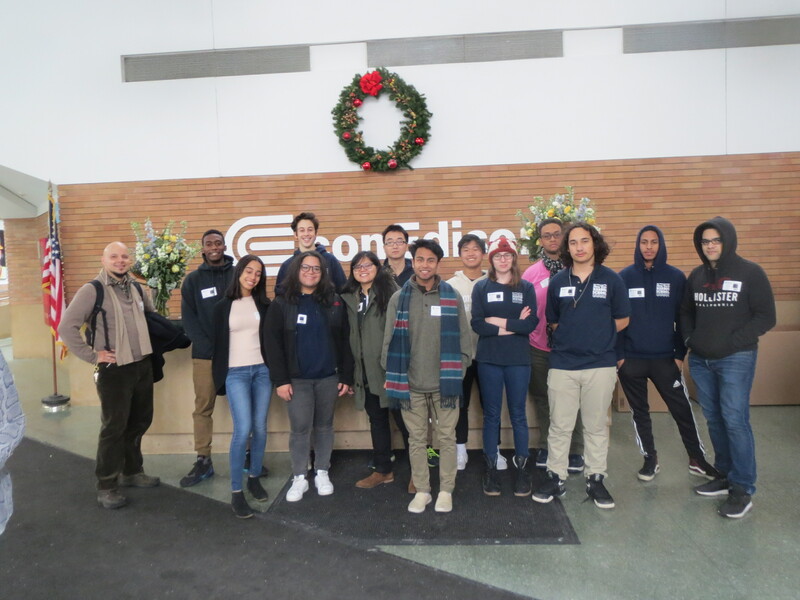 Our scholars got a tour of their world-class learning facility and learned about ConEdison’s unique employment programs and benefits as part of their Work-Based Learning program at the New York Harbor School. 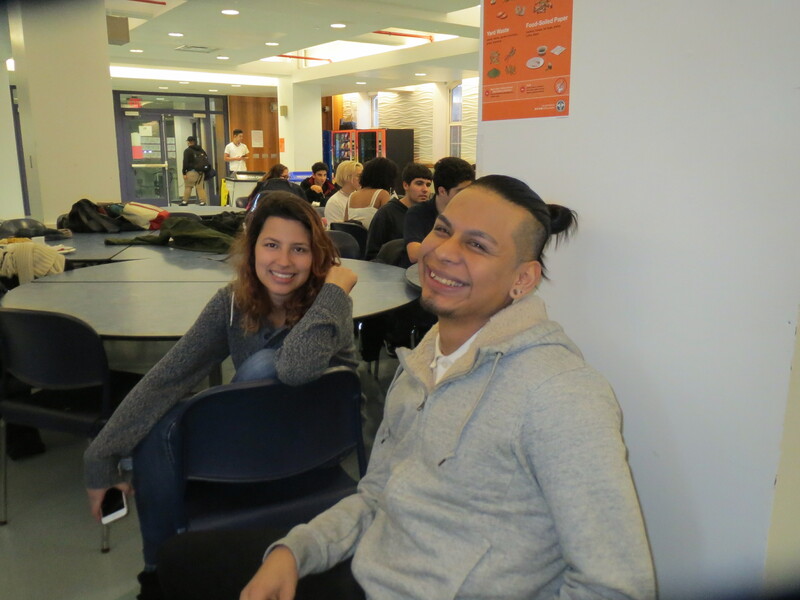 In January our senior scholars took their culminating Career and Technical Education assessments. All seniors took and passed the NOCTI Natural Resources Systems exam. Most scholars also qualified for three college credits through the assessment in Natural Resources Management. We also implemented for the first time the Precision Natural Resource Science assessment. This assessment will replace the NOCTI as part of the Career and Technical Education’s program re-certification process. 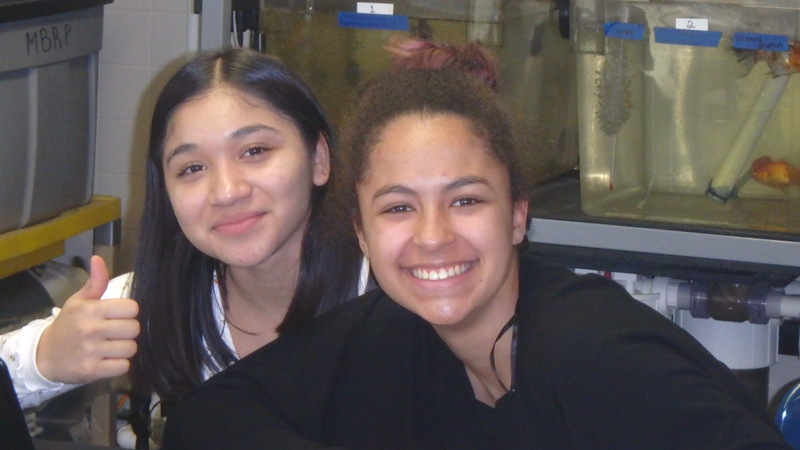 Also in January, five of our senior Marine Biology research scholars received notice that they have been accepted to compete in the prestigious New York City Science and Engineering Fair in March! This ranks them among the best science scholars in New York City. Our senior scholars have been busy with their Career and Financial Management course updating their Work-Skills Employabilty Profiles, updating ePortfolios and regular binder portfolios, creating LinkedIn accounts, and initiating an on-line writing exercise called the Self-Authoring Suite thanks to funding from NYC’s Department of Education Office of Teacher Recruitment and Quality. I have also had the privilege of meeting with NYC Chancellor of Schools, Ricardo Carranza, to discuss topics in school equity, bias, and diversity, among others, as part of the opportunities offered by the Big Apple Award. 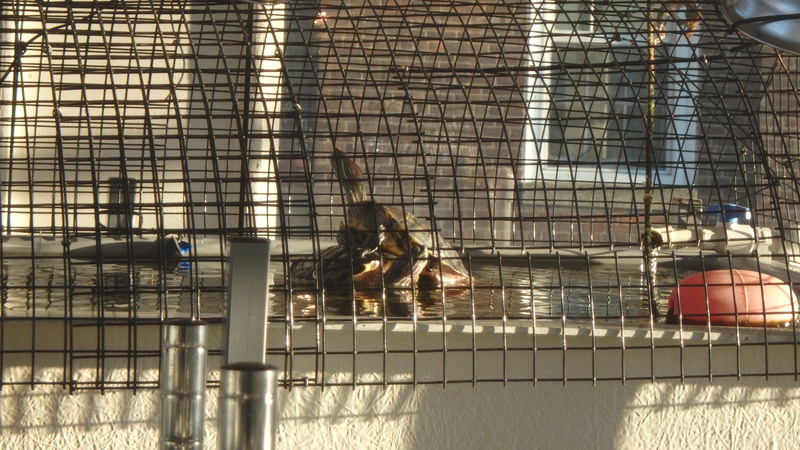 01) Installed heaters to an experimental tank to grow Red-Eared Slider turtles. We were also able to install new air and water pumps. 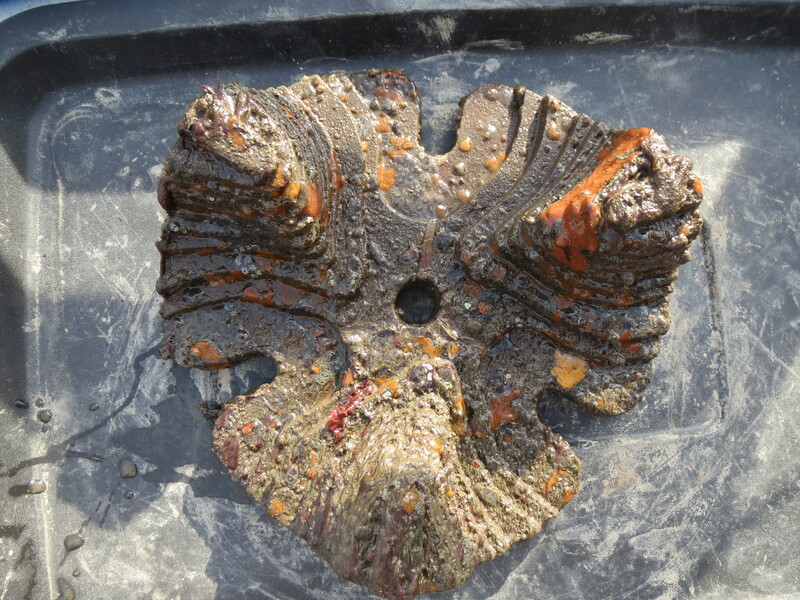 02) Our Biodiversity team has been hard at work planning the design of a long-term experiment to test for the biodiversity of marine invertebrates using Econcrete tiles in the Hudson River. We are in the process of purchasing the materials and plan on beginning the mixing of Econcrete cement in the coming weeks. 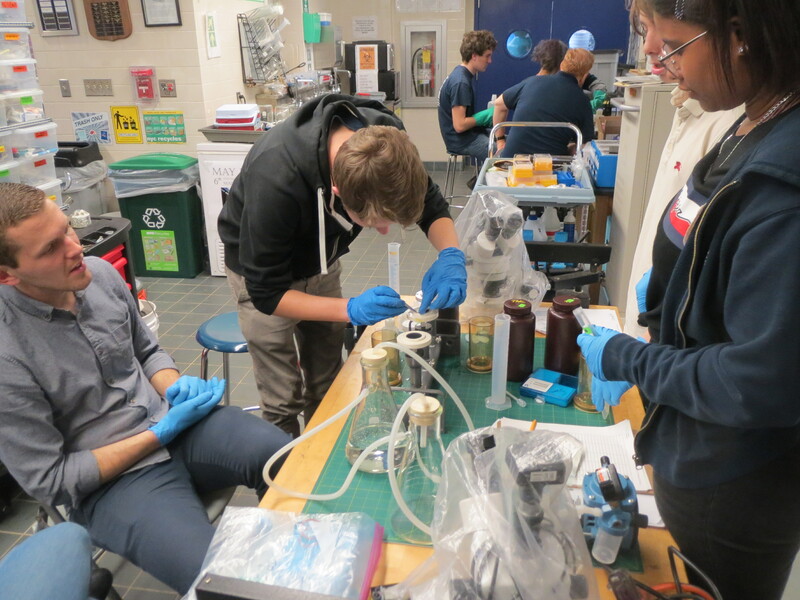 03) Our Physical-Chemical team has also been hard at work calibrating and maintaining their instruments in order to start sampling the Hudson River in February. They have been adding pH probes and conductivity probes to the machines and calibrating them in order to ensure precise and accurate measurements. 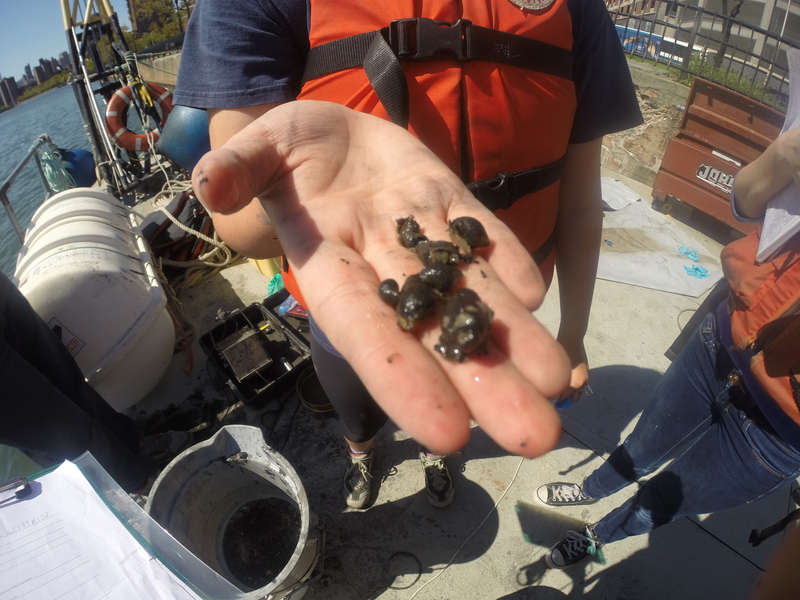 04) Our Microbiology team has been training the younglings to sample for E. faecalis and the relative concentrations of plastic and plankton in the Harbor. 05) Our Data Management team has been producing data tables and data flow strategies for our Team’s data collection efforts. 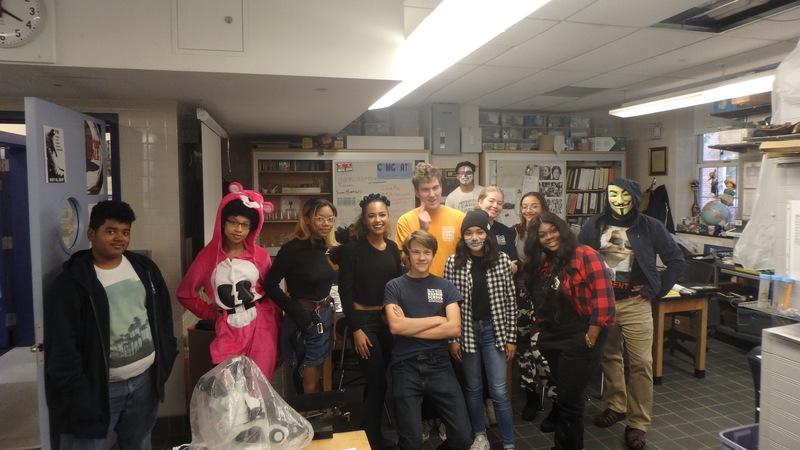 06) Our whole team has gone out for mock sampling events twice in the Fall semester. We plan on starting our field sampling this month. A heartfelt thank you to all our colleagues, family, friends, post-secondary, and industry partners for your continued support! Happy Lunar New Year! 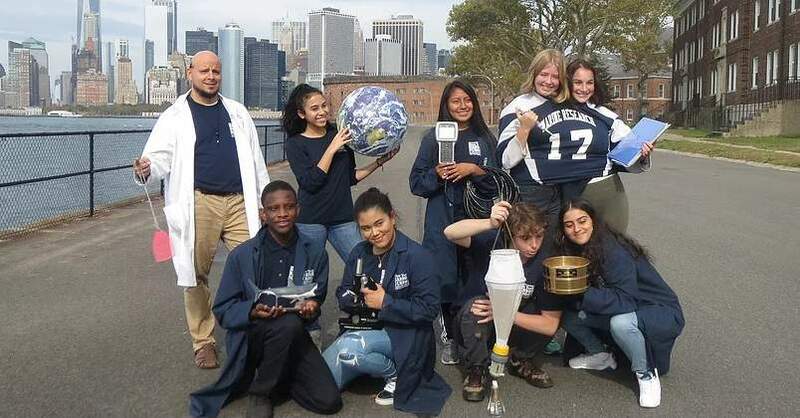 Go New York Harbor School Science! Valrie and Amaya, Red-Eared Slider turtles (Photo credit: Mauricio González). 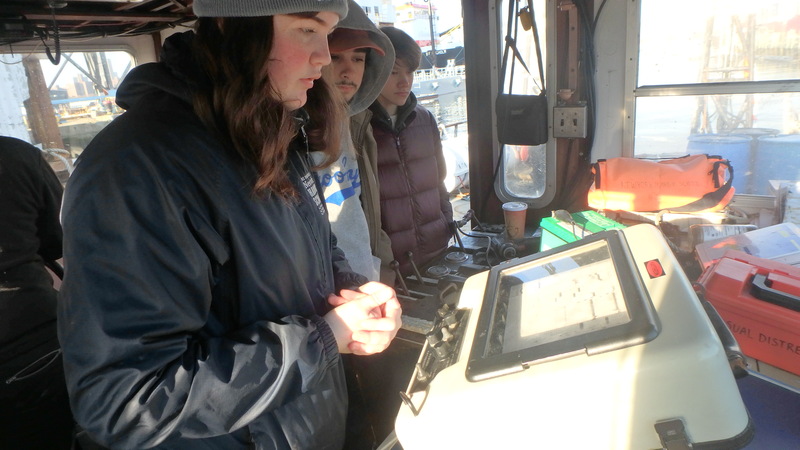 “Team Fathom” on a mission to measure the Harbor’s depth changes. “Team Fathom:” Nicholas Ring, Emily Lysakova, Gabriel Castro, Kyle Walter, and Jonah Florholmen-Bouman. 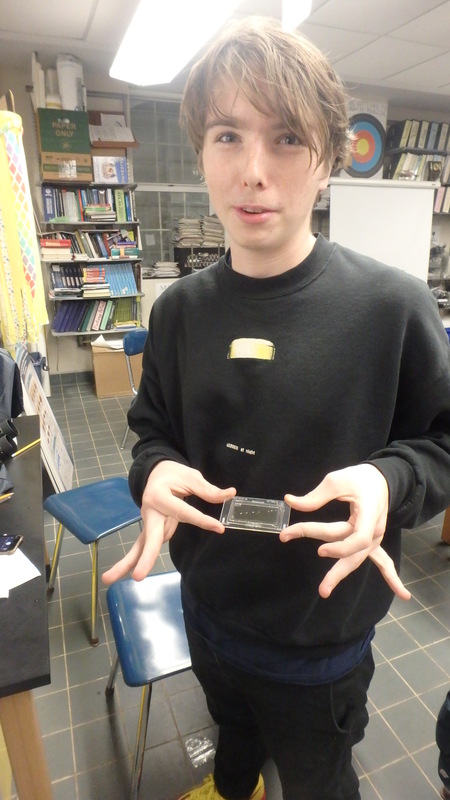 Leo McGuinness, Team Microbiology Co-mentor showing off his Sedgewick-Rafter plankton counting cell. 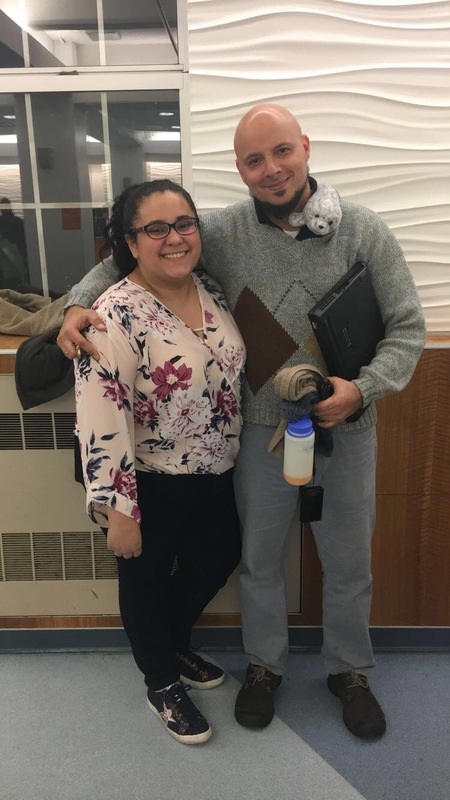 Marine Biology Research Program alumnus, Seth Rivera, class of 2018. December Professional Advisory Committee members meet and greet with our Marine Biology Research Scholars. 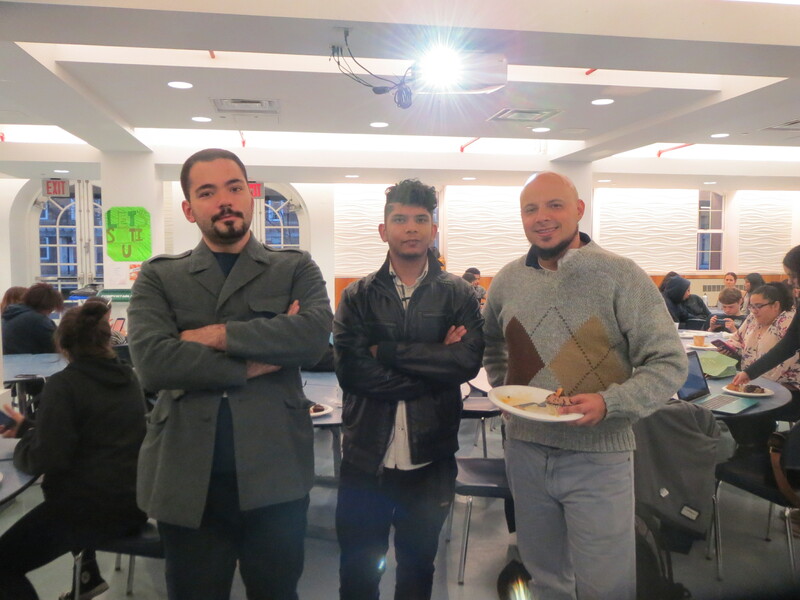 Many of our scholars are being mentored by our PAC members in long-term research projects (Photo credit: Mauricio González). 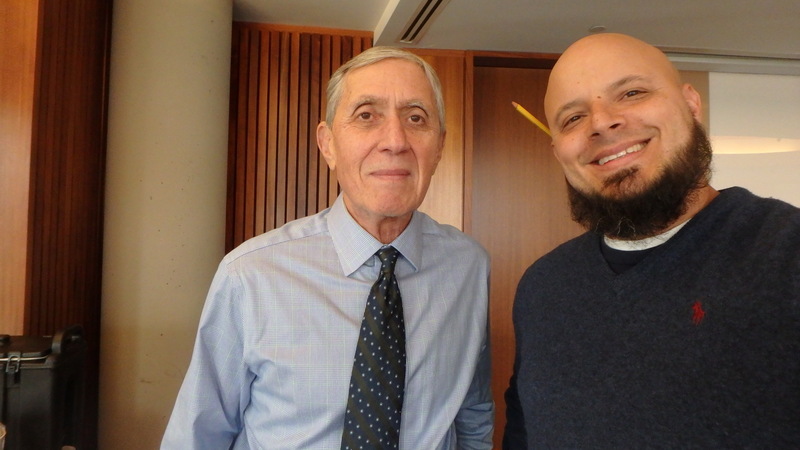 Dr. Allen Spiegel and Mauricio González. Our visit with Con Edison’s Andrew Simpson and Michael Kessler at their world-class Learning Center. Celebrating Winter Solstice with our senior marine research scholars. Rosalia prepared special treats for us. Our Harbor SEALs Junior leadership: Lisette Mejia and Jacqueline Obermayer, Project Manager and Operations Analyst respectively. 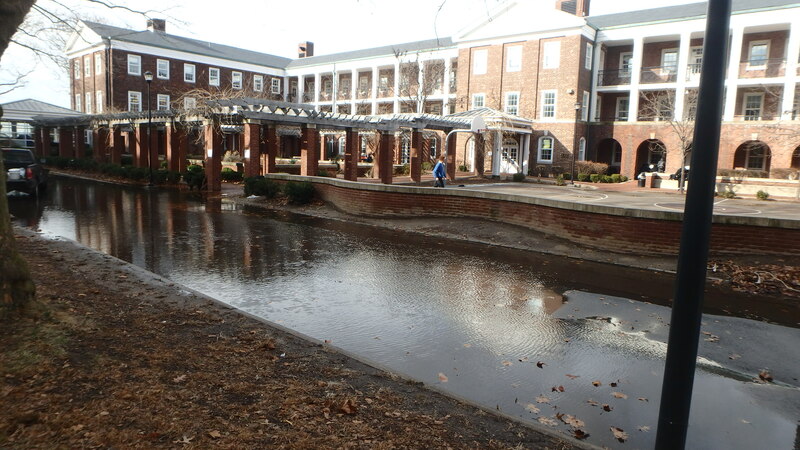 Our unofficial NYHS pool/ice skating rink! Greetings MBRP partners, alumni, scholars, and friends. Embarking on our 8th year of operation we “push off the dock” with the momentum of our achievements of the past year (see below). 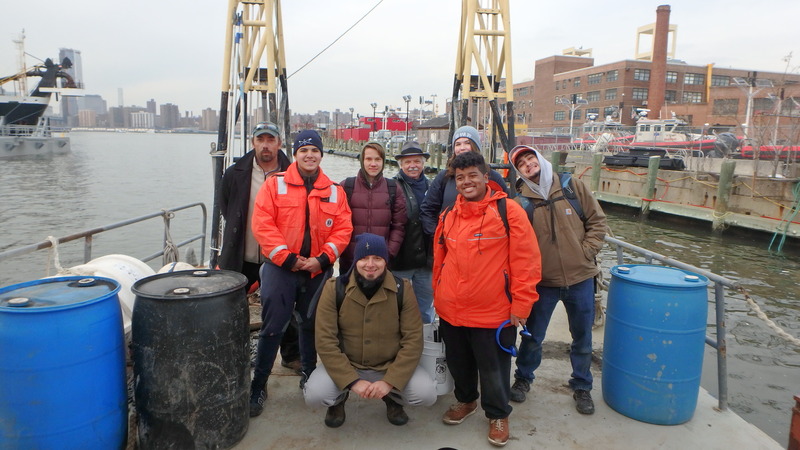 This year our Harbor SEALs Citizen Scientists are working with the Billion Oyster Project to monitor the ecological conditions off of Pier 101, Governors Island. Our MBRP senior scholars have been hard at work on their mapping curriculum, research projects, and career and financial management projects. Take a look at this year’s gorgeous senior web site portfolios. 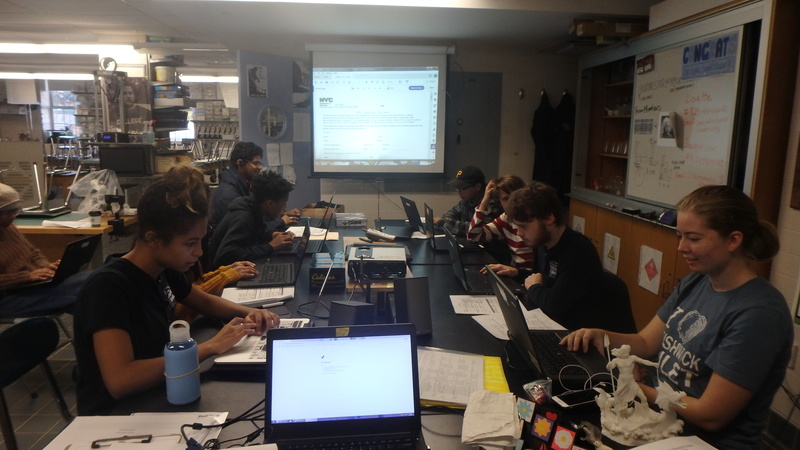 Our 11th grade MBRP scholars have also started their mapping curriculum and their research plans. Next, over the summer our scholars read the book “Zen and the Art of Motorcycle Maintenance” and completed a creative project based on their reading. Check out 11th grade research scholar Tyler Simpson’s compelling video. Our 10th grade MBRP scholars have just completed the first unit entitled: Introduction to Scientific Methods. They have also completed their first MBRP lab reports. Way to go 10th grade researchers! When you get a chance, glance through some of last year’s culminating research projects. Lastly, we have two upcoming major events: 01) join us for our 7th annual SEALs-Giving dinner on November 21st, 2018 between 3:30 and 5:30 at the NYHS Mess Hall; 02) join us for our 7th annual Professional Advisory Committee (PAC) meeting on December 5th (details TBA). We hope to see you soon. Gobble, gobble! Marcus Charles: Winner of the MBRP TRIDENT Award. What a whirlwind of a Spring semester! First off: Marine Biology Research Program class of 2018, you will be missed dearly. I know I say this about most graduating classes but I can’t get used to the loss. You’re all moving on to your next goals stronger, smarter, and as self-reliant young adults. The future is your oyster. I am confident in seeing you off. Change the world! The 2018 Spring semester has been marked with numerous accomplishments. 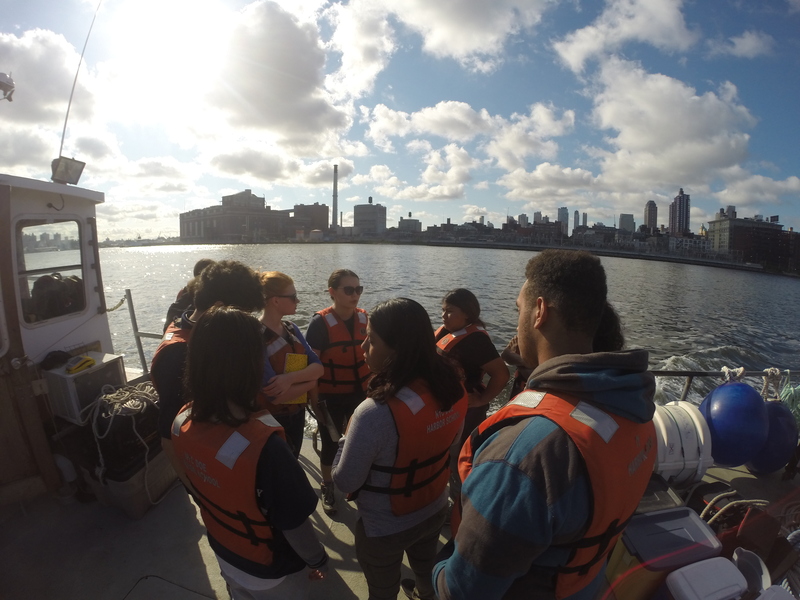 On 19 May, 6 MBRP research scholars embarked on an expedition up the Harlem/East River to retrieve a 2 year-old ecological experiment. 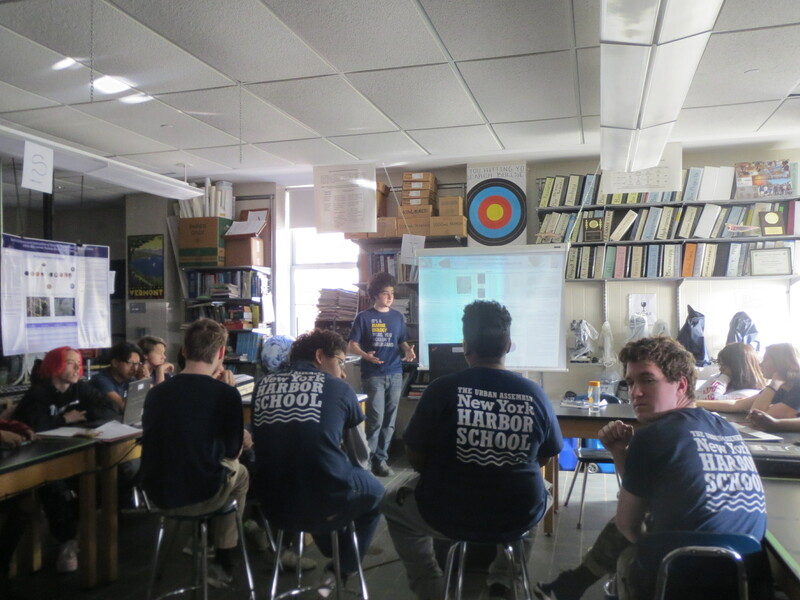 Led by our senior project manager Nicholas Ring, this expedition put a close to Phase Two of the CIVITAS-New York Harbor School project to determine the baseline conditions of the Harlem/East River and to test different construction materials for their effect on marine biodiversity. Water was spraying us from all directions as we pulled up nine 40+ pound experimental units onto the Indy 7 from the river. 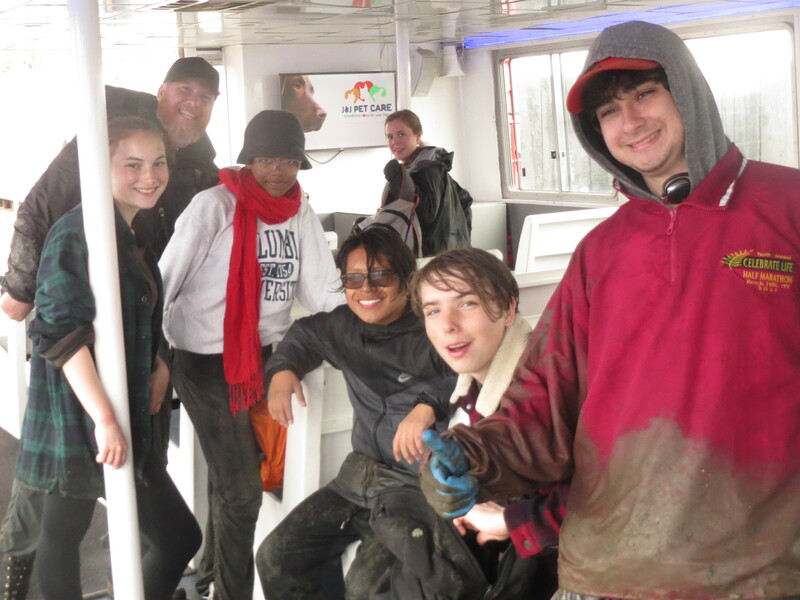 The rain above and the muddy waters from below tried slowing us down but we pulled together as a team of marine scientists and maritime crew to finish ahead of schedule. A million thanks to the Indy 7 Captain Kirsten Johnsrud, First Mate Halcyon Spooner, and their young crew for your invaluable help and leadership. Equal thanks to our Harbor Class instructor Sean Lynch for stepping up to lead the crew. For PHASE TWO results click here. 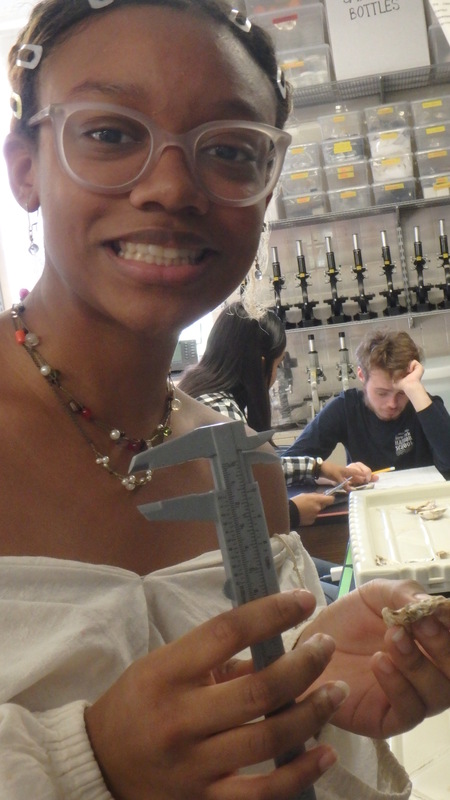 On May 16 the New York Harbor School hosted its 7th Annual Marine Science Symposium. 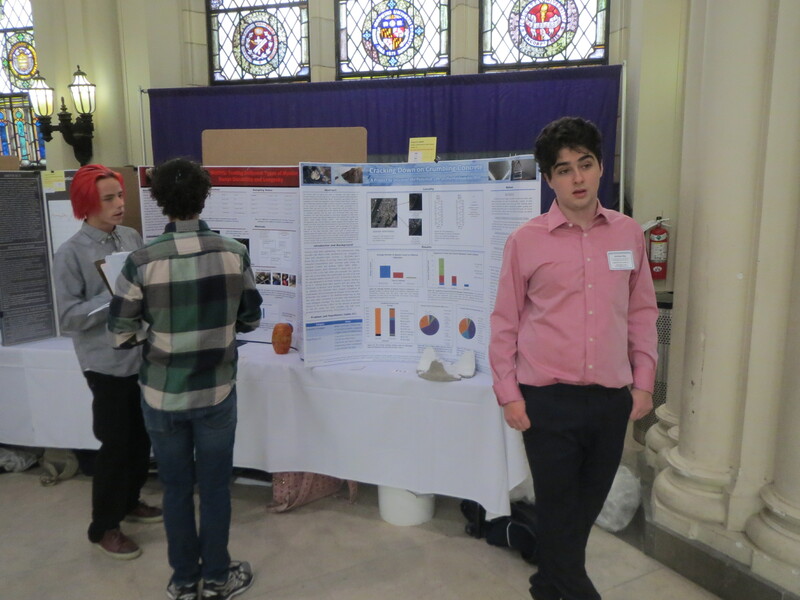 We had over 50 projects on display and over 60 volunteers from various industry & post-secondary institutions, not to mention our guests from the Netherlands led by Marc Van Breukelen to help judge. The theme this year was Godzilla- fictional character and product of the unbridled marine contamination that ensued after World War II. Godzilla came to represent nature rising to warn humanity of the perils of altering the Earth’s delicate balance. During the symposium we also introduced a new award called the MBRP Trident Award of Excellence. This award is given to a MBRP scholar that has accomplished all three of the following feats: 01) has earned all the possible college credits offered by the MBRP, 02) has competed in the NYC Science and Engineering Fair or obtained GIS SPACE certification, and 03) has assumed a leadership position in the Harbor SEALs Citizen Science after school team. Two MBRP alumni have accomplished these ambitious feats and were bestowed with this honor: Cezanne Bies (class ’16) and Melanie Smith (class ’17). Thanks to our former CIVITAS Project Manager Maura Smotrich for delivering a beautiful keynote address. To view the Symposium Booklet with the complete list of volunteers, senior autobiographies, project titles, and Symposium results click here. 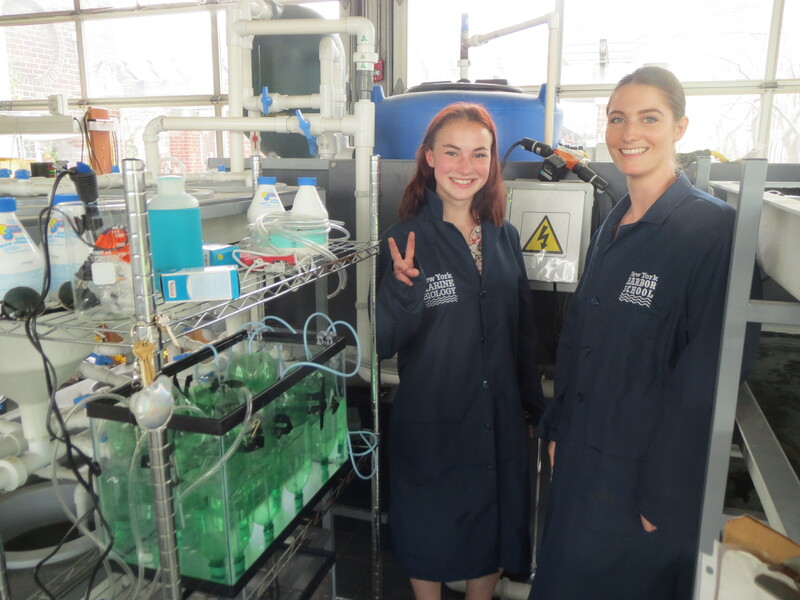 Back in the lab, our young marine scholars have been hard at work. 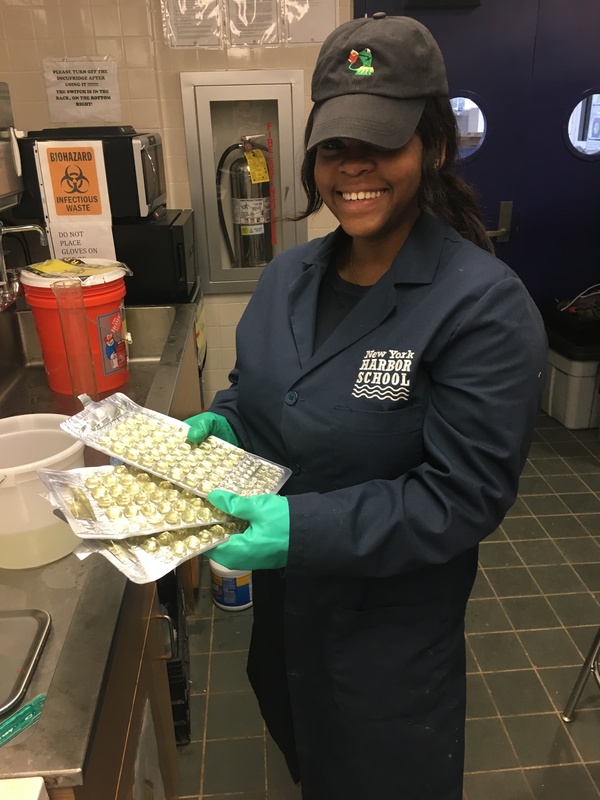 Our junior scholar Aaniyla Allen-Sutherland has been monitoring the health of our Harbor waters by testing for Entrococcus faecalis. 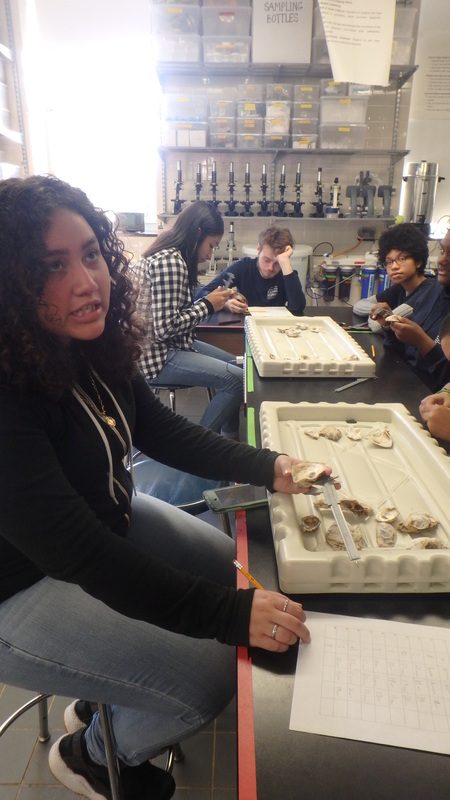 Our junior research scholar Lauren Salitan has been testing the effects of chlorine concentrations on the survivor-ship of oyster larvae. 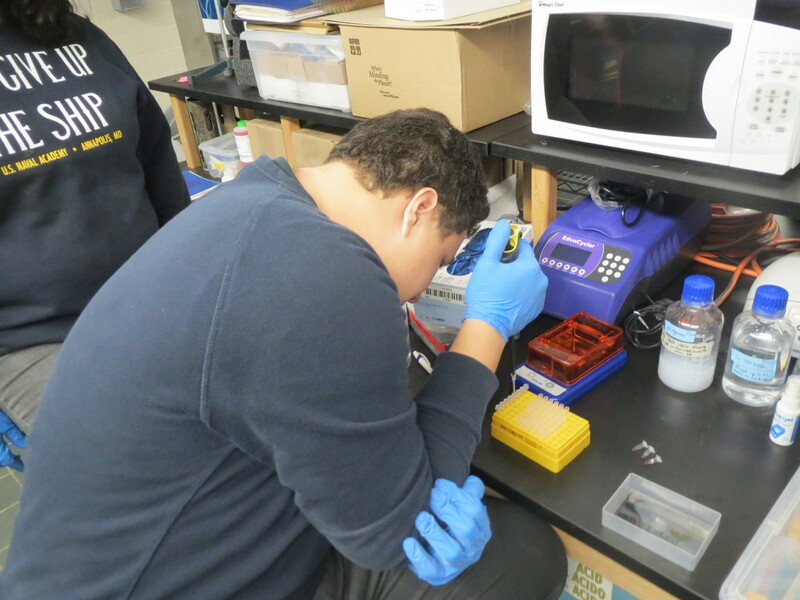 And our freshmen and sophomore scholars have attempted to bar-code marine invertebrates for the first time at our lab on Governors Island. 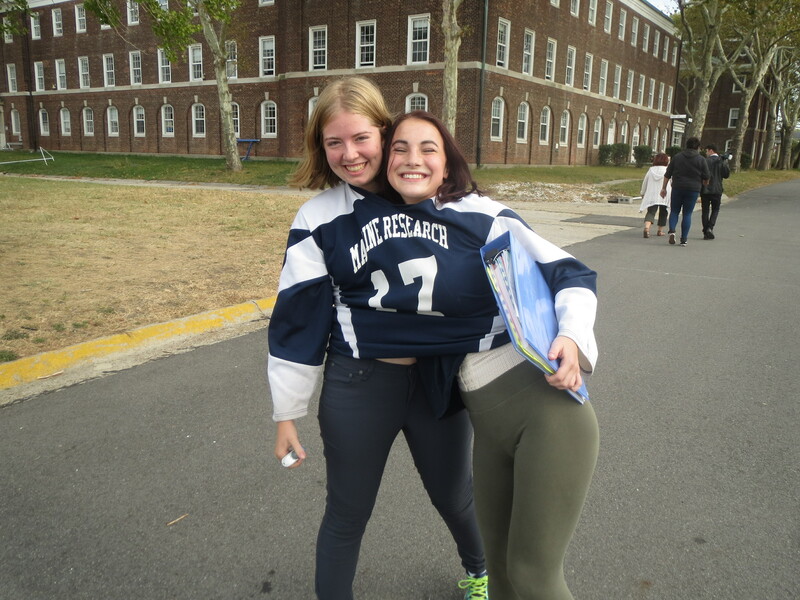 Some of the best moments of the school year are when alumni visit. They’ve come for our SEALs-giving dinner, Marine Symposium, and just randomly throughout the year. Below are photographs of just some of the many alumni who’ve stopped in this year. 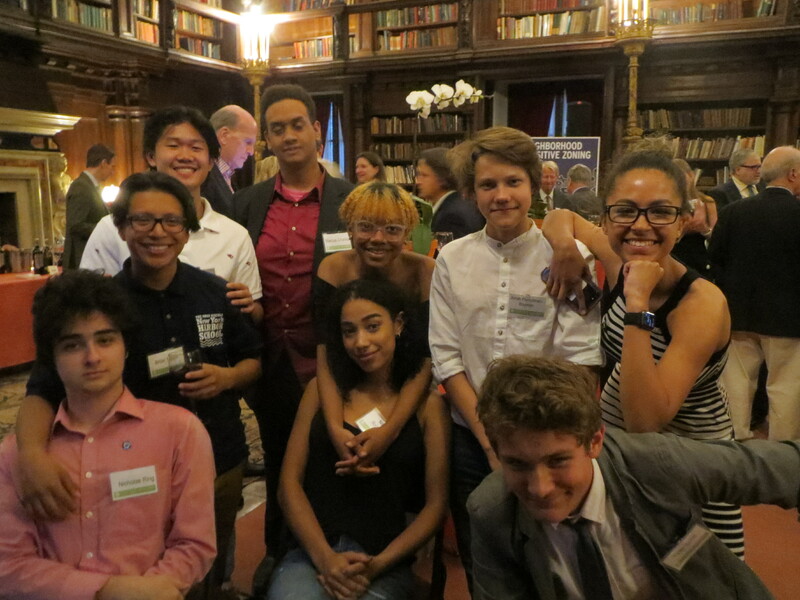 To have a little fun, our Harbor SEALs scholars participated in the CIVITAS annual benefit. 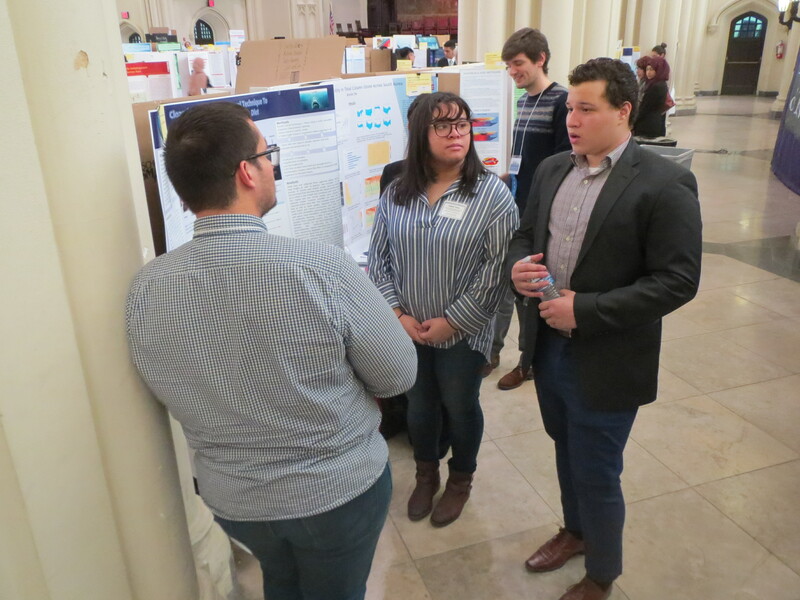 They presented their monitoring results of the Harlem/East River to residents and politicians from all over NYC at the House of the Redeemer by Central Park. 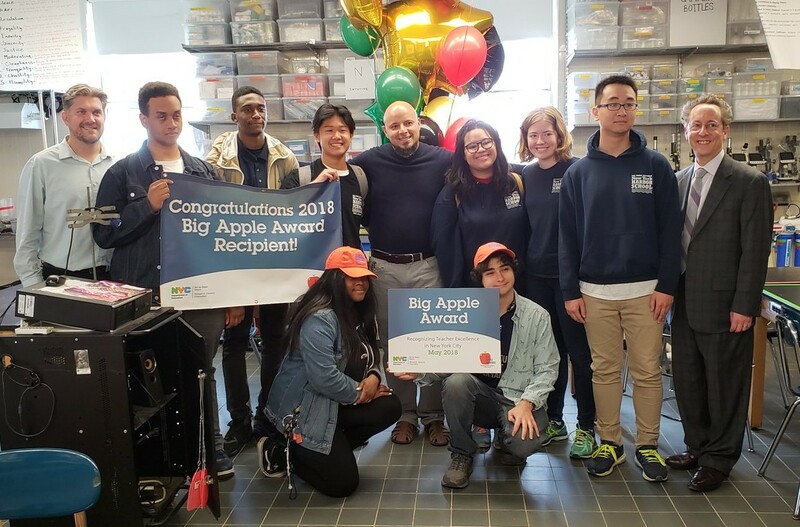 And after many years of sacrifice, hard work, and grit, Mauricio Gonzalez wins the Big Apple Award for 2018! Next school year as a Big Apple Fellow, he’ll be convening with school officials to share and learn best practices. The 2017-2018 winter season has been busy as usual for the Marine Biology Research Program and Harbor SEALs Citizen Science Monitoring scholars. Below we put together a sample of some of the activities we’ve been a part of during the 2017-2018 winter season. Thanks again to our industry and post-secondary partners for your continued support. 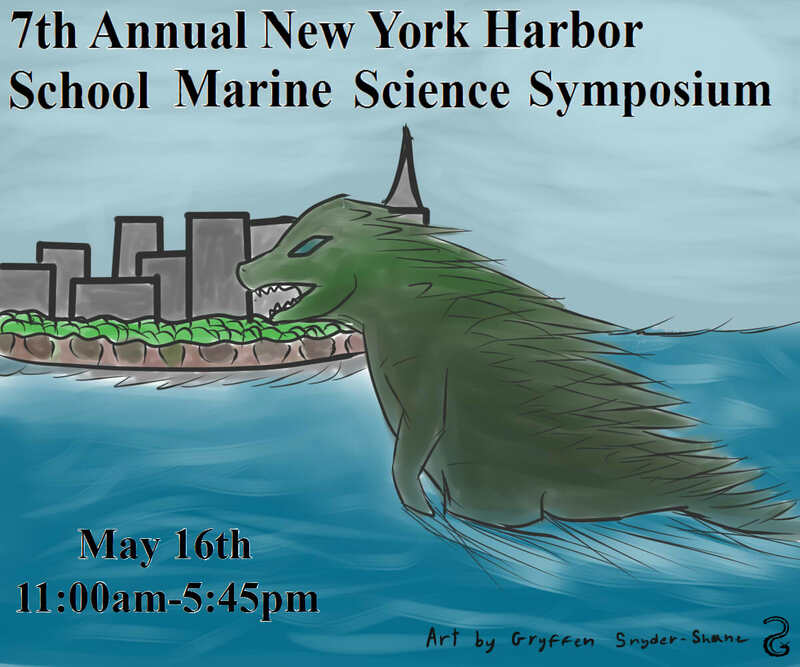 Please mark your calendars: on May 16 the New York Harbor School will be hosting our 7th Marine Science Symposium. More information will be forthcoming. We hope to see you there. Enjoy the images!!! Nicholas Ring presents his project to the Harbor SEALs younglings to set the level of excellence expected of those coming up in the MBRP. 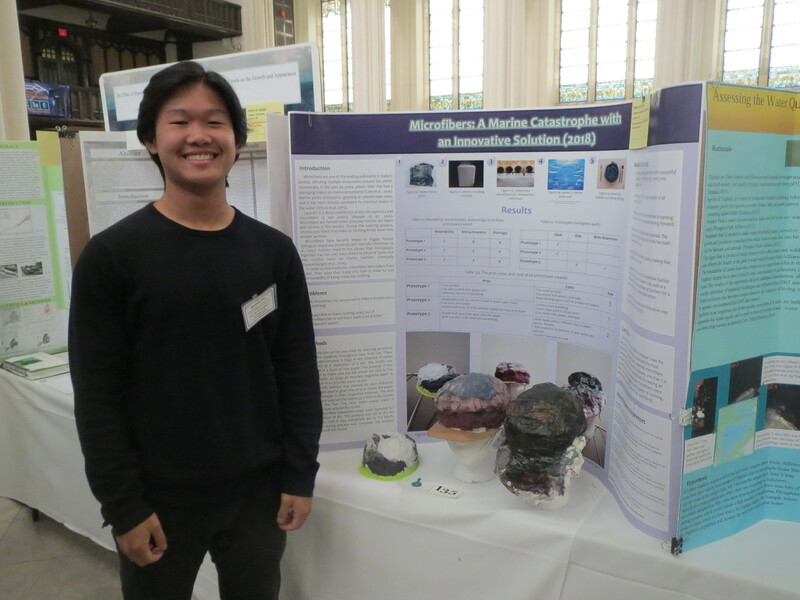 Matthew Chiu shows off his hats made of up-cycled microplastic fibers derived from laundry machines and dryers. 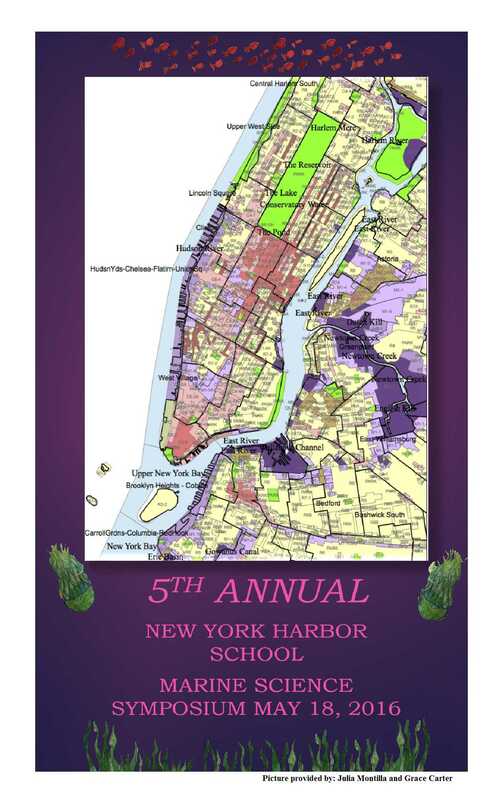 MBRP and Harbor SEALs director, Mauricio Gonzalez, has advanced to the finals in the prestigious NYC Big Apple Awards. Up to five finalists were named per district – roughly 250 across the city out of more than 4,500 teachers nominated this fall. The final 15 winners will be announced in the coming week. Our Harlem/East River Lab. PHASE TWO of our CIVITAS consulting work to provide the necessary information on restoring the marine natural environment. (Photo by Mauricio Gonzalez). 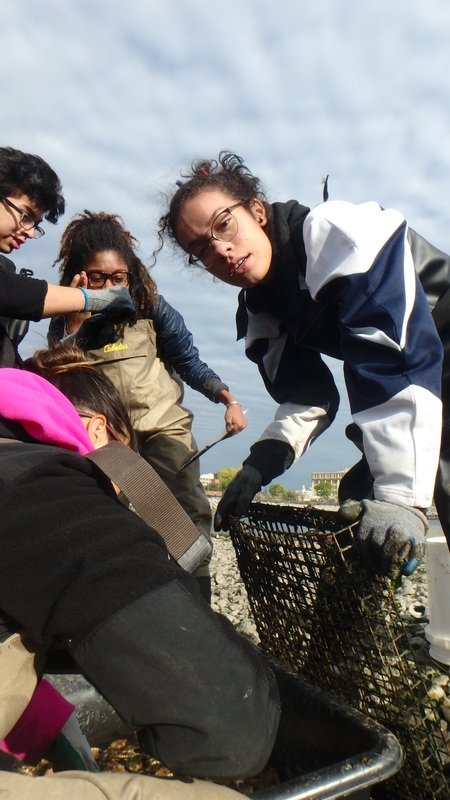 The 2017 – 2018 school year marks the Marine Biology Research Program’s (MBRP) seventh year of operation and fifth year as a New York State Education Department (NYSED) certified program. This year we’re up for NYSED re-certification and it would be fitting to highlight the achievements of just the last six months with some stats. At the close of our last semester 80% of our students obtained the Career and Technical Education endorsement on their high school diplomas; sixty-four college credits were awarded; seventeen paid internships with over 1200 hours were worked as science consultants with our partners at CIVITAS Citizens, NYU, and Earth Matter; two of our three Geographic Information Systems scholars were the first in New York State to be certified in Digital Quest’s SPACE program; and 100% of our marine research scholars passed the industry assessment: NOCTI’s Natural Resources Systems Management. Most of these achievements are school bests. 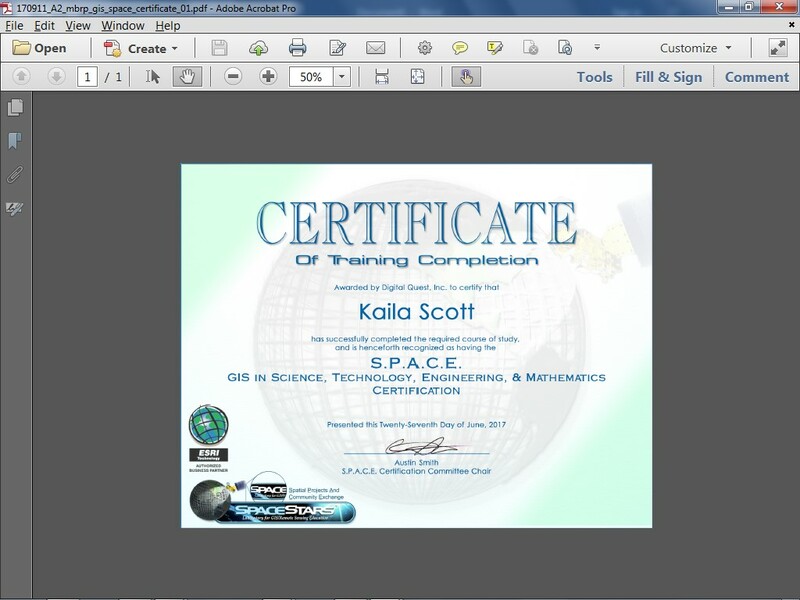 GIS SPACE certificate. 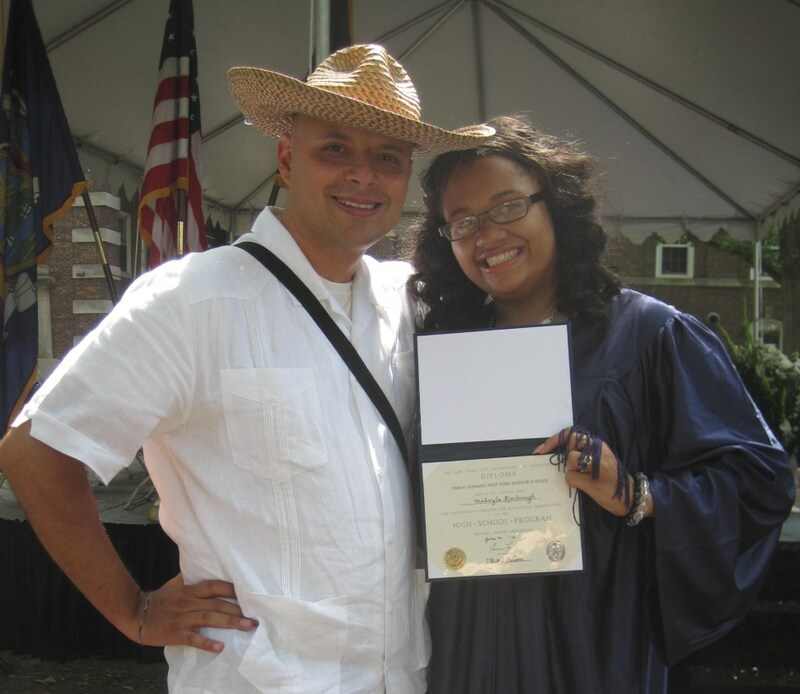 Kaila is one of the first high schoolers to be certified in GIS in the State of New York. This year we were able to secure critical lab equipment that were in the plans for over five years. 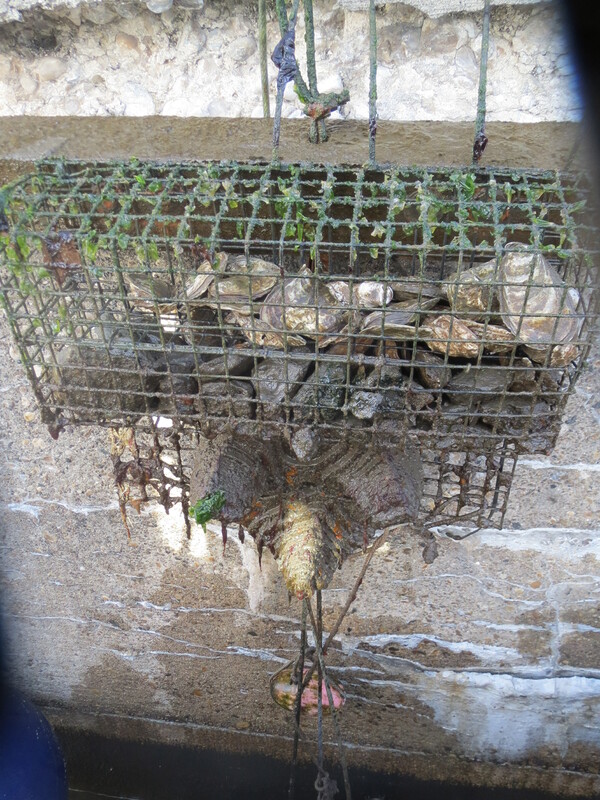 Among these were genetics gear to barcode the marine organisms of the Harbor, stereoscopes to study and identify these same organisms, updated laptops to run our GIS curriculum & complete our long-term research projects, and dedicated table tops to calibrate YSI meters. 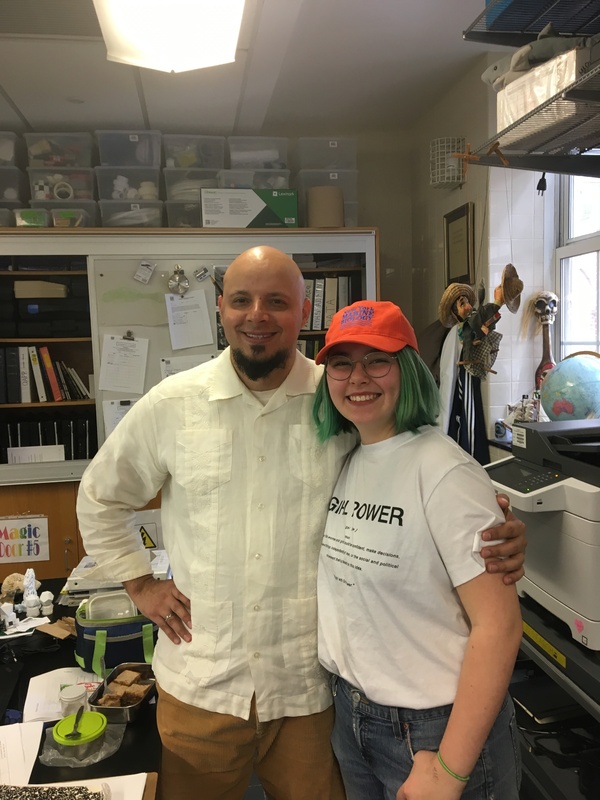 Our Senior Project Managers, Nailea Rodriguez and Nicholas Ring (Class of ’18), together with our twenty-five Harbor SEALs Citizen Science after school program team members are near completing PHASE TWO of their work for CIVITAS Citizens. This year’s work has been the best on record in terms of planning, communication, operations, data management, and report writing. 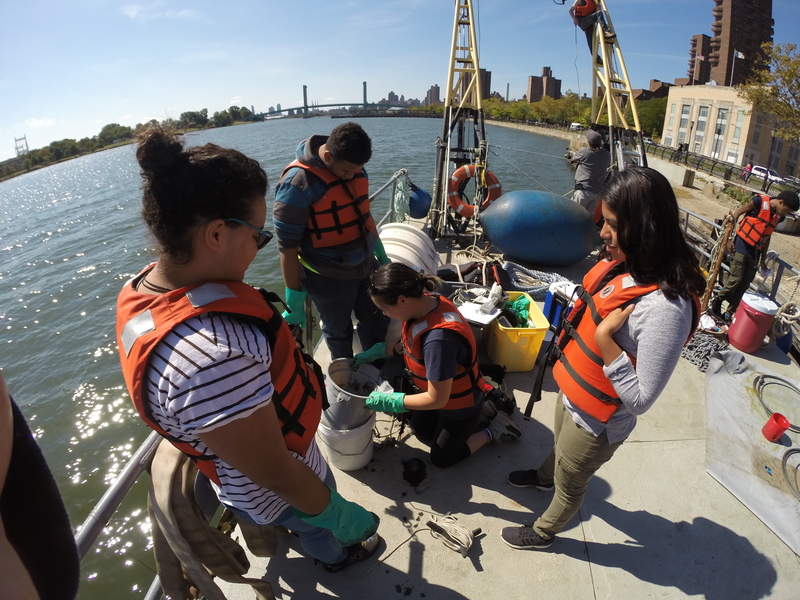 Our Junior project manager and Operations analyst, Lauren Salitan and Cyd Bloomfield (Class of ’19), have led near flawless sampling runs up the East/Harlem River. 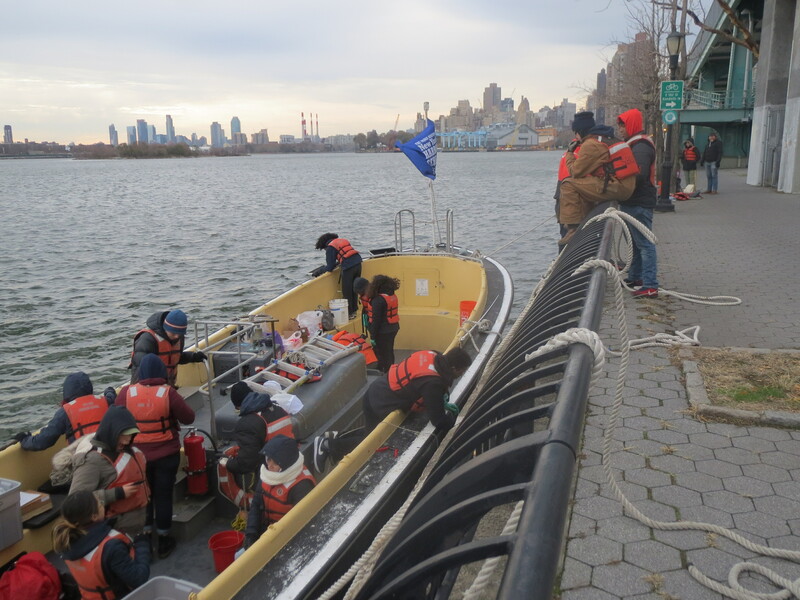 For more images of our sampling on the East/Harlem River click here. Cyd and Lauren, Junior Operations Analyst and Project Manger respectively. Our professional Advisory Committee met on 6 December to meet our seniors and convene as our Scientific Review Board. Every year our partners come together to review new project proposals and research drafts. It can never be stressed quite enough how the PAC’s level of commitment to the MBRP has elevated the quality of the work we do. For more images and information on our 2017 PAC please click here. 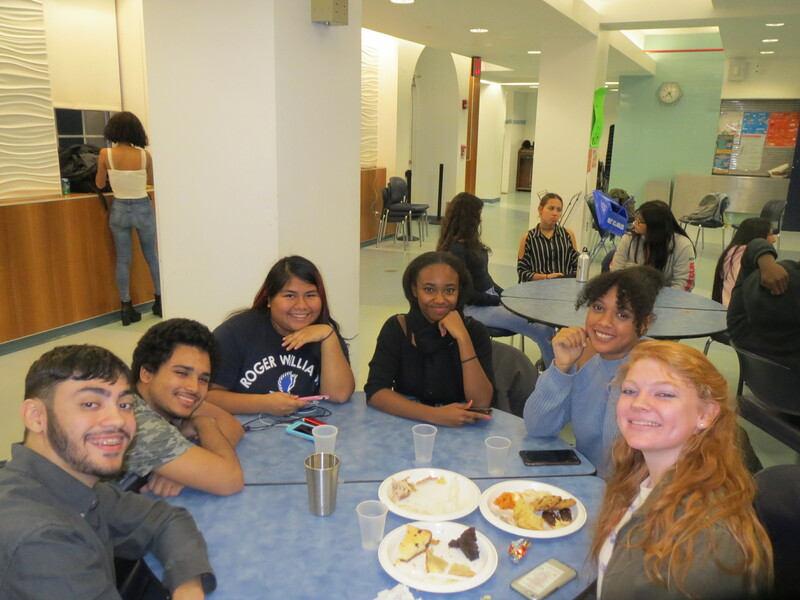 This year we’d like to highlight two of our partners: Bronx Community College (BCC) and ConEdison. 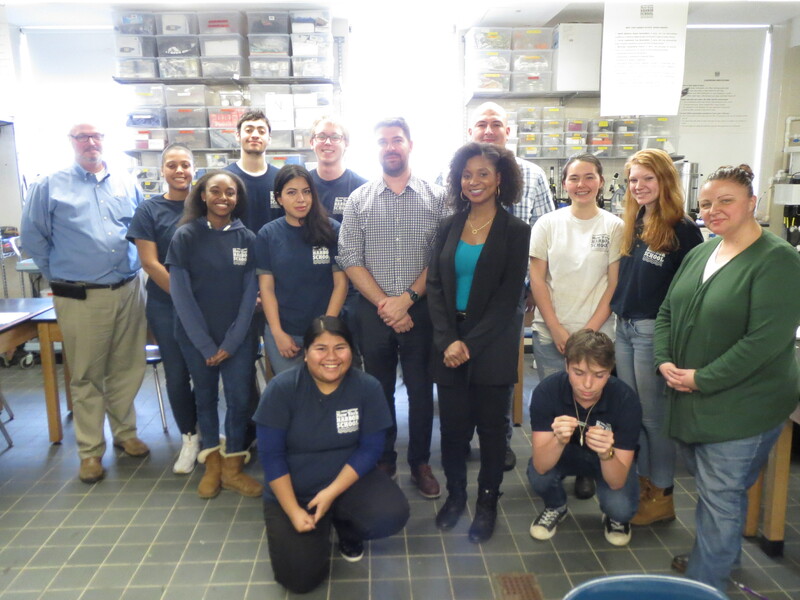 BCC and its Chemistry Department Chair, Dr. Neal Phillip, donated a professional grade weather station and ten high-volume printers to the New York Harbor School-BOP and have agreed to sign a five-year articulation agreement between our GIS labs. 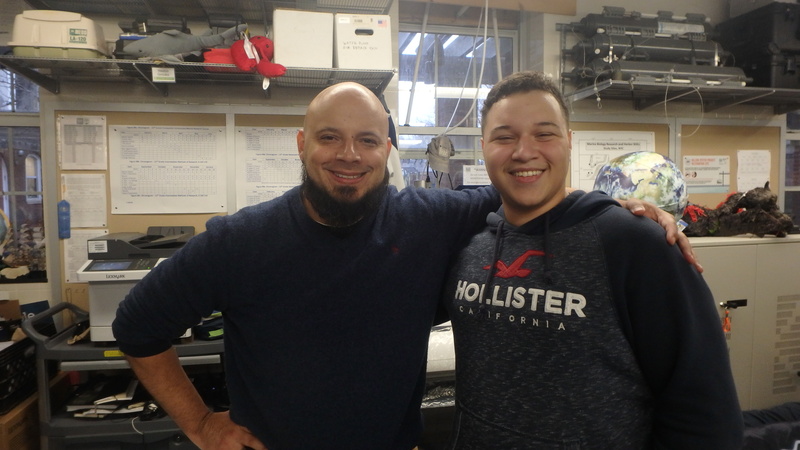 ConEdison, under the representation of Michael Kessler and Michael Porto, has renewed a grant to perform lab experiments on contaminants found in the Harbor and their effects on oyster larval development. 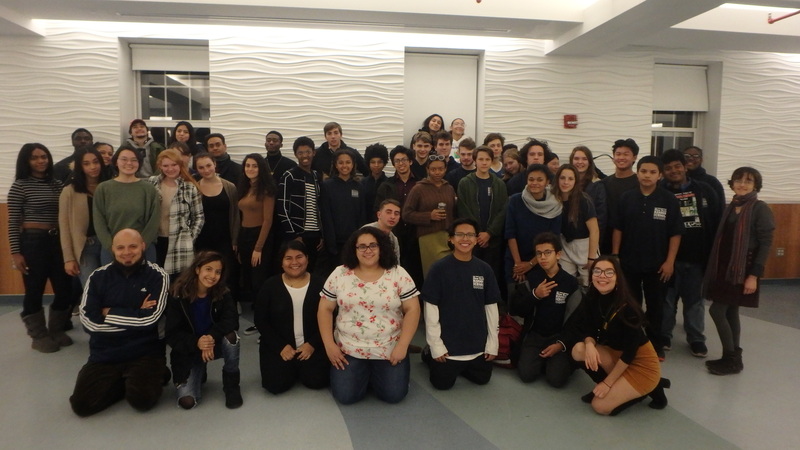 On 15 December, ConEdison’s Andrew Simpson gave us an exclusive tour of their world-renowned education facility located in Long Island City. 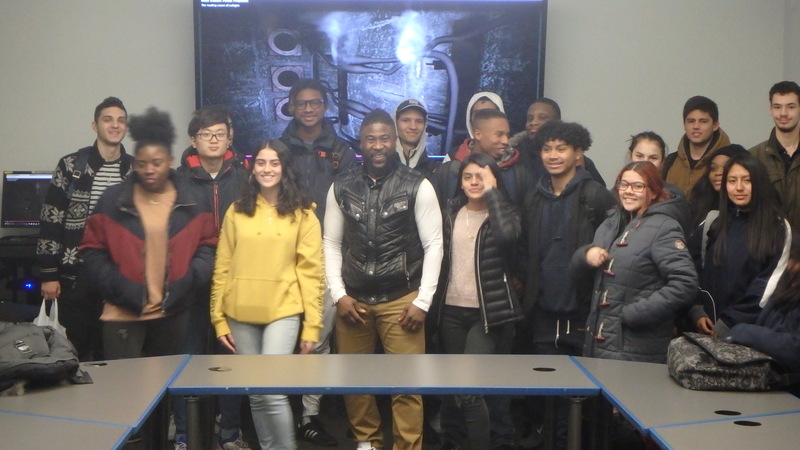 Thirteen of our scholars got the inside scoop behind ConEdison’s techniques to maintain the largest underground power grid on the planet. They also gave our scholars a perspective on careers offered, and priceless advice on adapting to the ever changing world of work, namely, “learning how to learn.” For more images of the tour click here. Starting July of 2017, Liz Burmester joined the MBRP family as our very own BOP Professional. She comes to us with expert training in community ecology after having finished her doctoral work at Boston University. She’s passionate about science and education. Her doctoral thesis was on a temperate coral species and its recovery based on biological and environmental conditions. She has also taught at the New England Aquarium and mentored many undergraduates. Because of these experiences, she has enhanced the quality of our research at the MBRP. Specifically, she has personally met with all our scholars and reviewed their project proposals and drafts. She’s also brought a fresh perspective on the complex world of secondary education. We are grateful to have her as our newest team member. Lastly, as is our tradition every year, on 22 November we celebrated our SEALs-giving meal together. It was exciting to see our alumni interacting with our youngest members and sharing their best experiences in the Program. 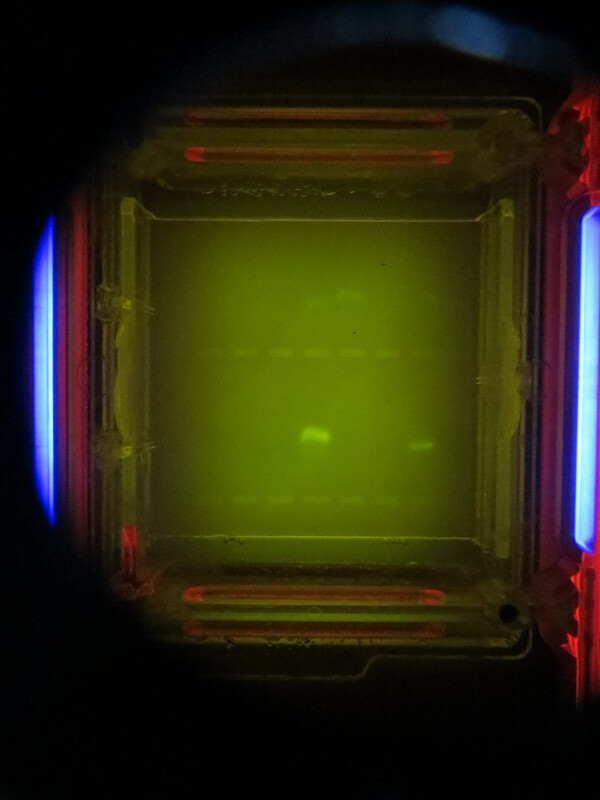 My favorite stories dealt with the countless times we had to go out and sample in Manhattan’s sub-freezing winter weather or having to run to the ferry – to the school – to incubate bacteria, clean up, and get back on the last ferry in less than forty-five minutes! For more images of our celebration click here. Thanks for all your support! The MBRPers and SEALs family would like to wish you a HARBOR NEW YEAR! 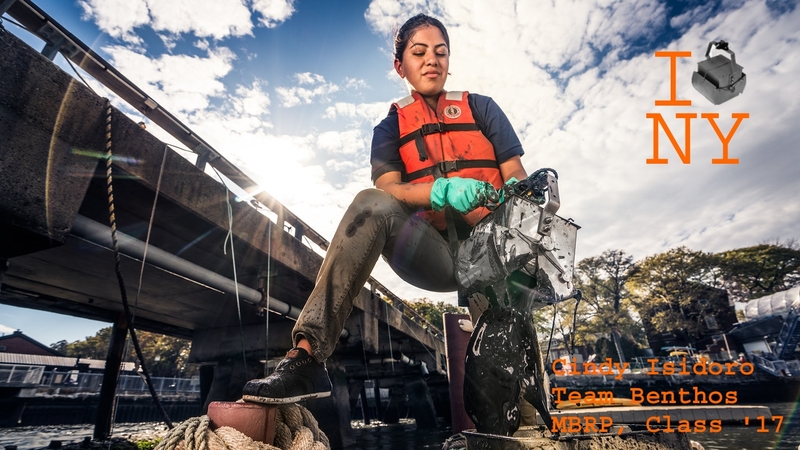 Cindy Isidoro, class of ’17 and Team Benthos mentor (Photo Credit: Van Wong). The 2016-2017 school year has been one of the most successful for the students of the Marine Biology Research Program. 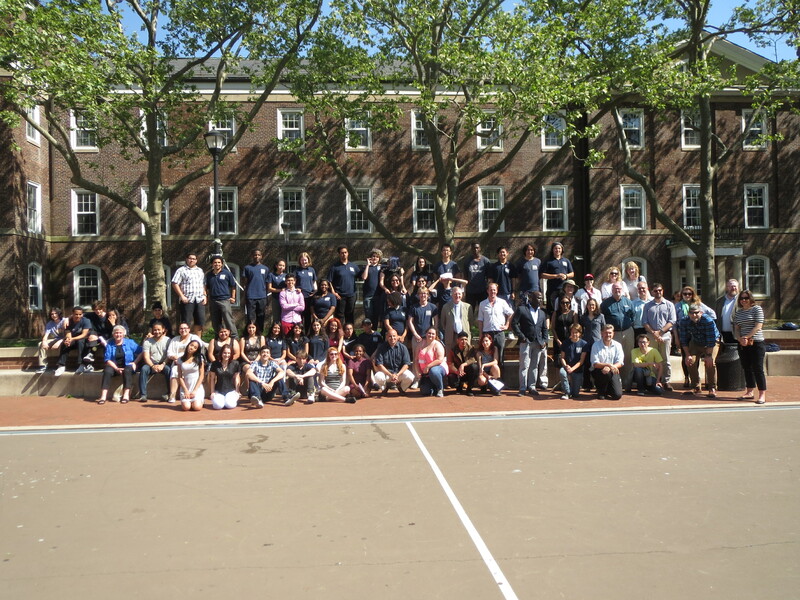 This year our scholars completed phase one of the CIVITAS-NYHS East River Esplanade baseline study. To see our students in action click here. 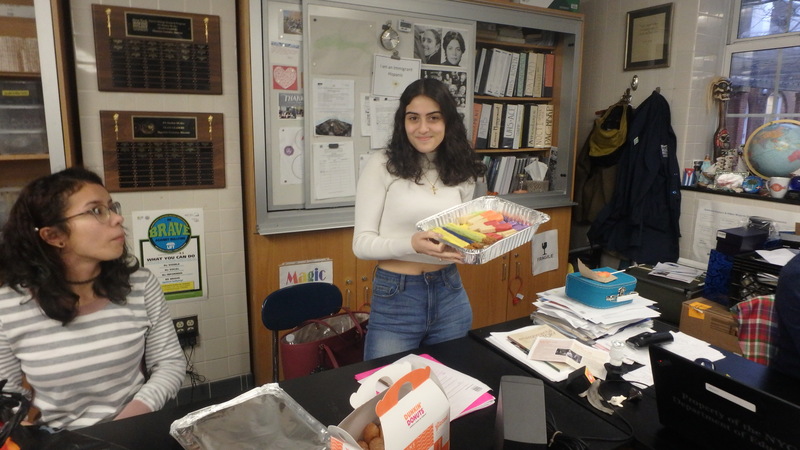 Next, with over half a million students in NYC high schools, five-hundred fifty that apply to compete at the New York City Science and Engineering Fair, to just over one hundred that make it to the finals, the Marine Biology Research Program had two scholars selected for the Second Award in the category of Environmental Science. In total we had a School record breaking high of five students who competed this year. NYCSEF 2nd Award Winners Grace Carter and Jared Rosin. Considering that the Urban Assembly New York Harbor School is an un-screened school and that we’re going up against the top screened public science and private schools in the city (i.e. 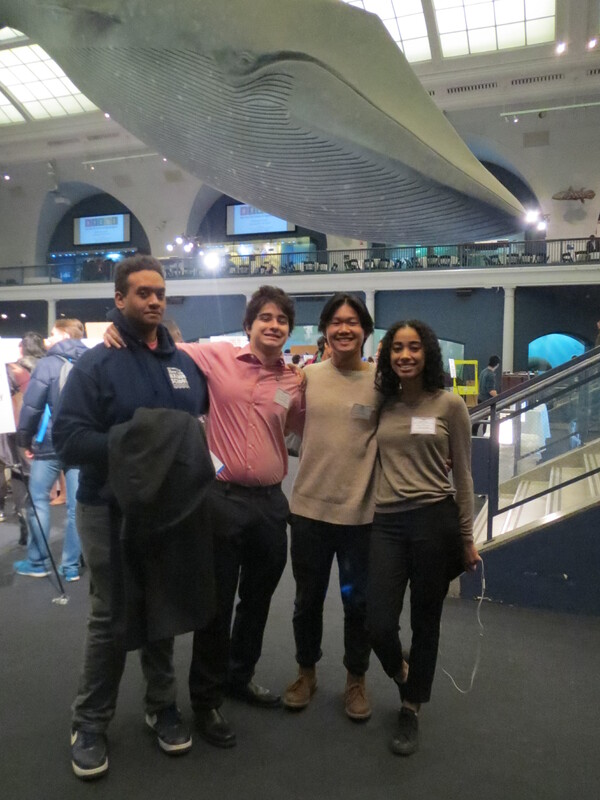 Bronx Science, Brooklyn Tech, Townsend Harris, etc.) this accomplishment is impressive to say the least. 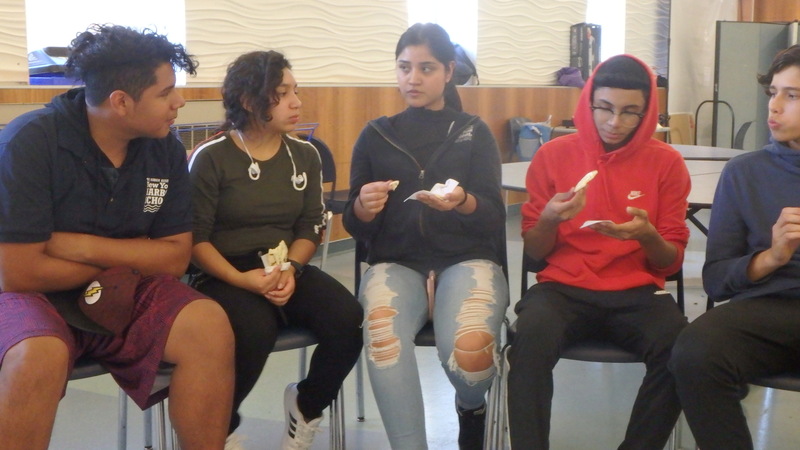 Four out of the five that competed were female which are all planning on pursuing a career in STEM; one was an ex-English Language Learner; and one had an Individualized Education Plan. This is testament to what can happen with dedication, team work, and, most importantly, believing that all students can excel when given the opportunity and the right environment. 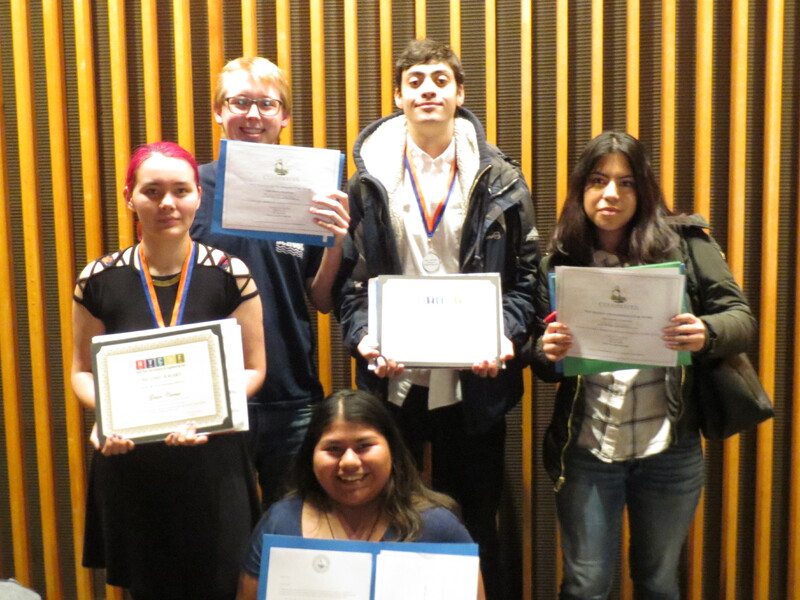 2017 NYCSEF Award Winners Grace Carter, Melanie Smith (Erik Wiemer standing in), Jared Rosin, Cindy Isidoro, and Katha Conklin. 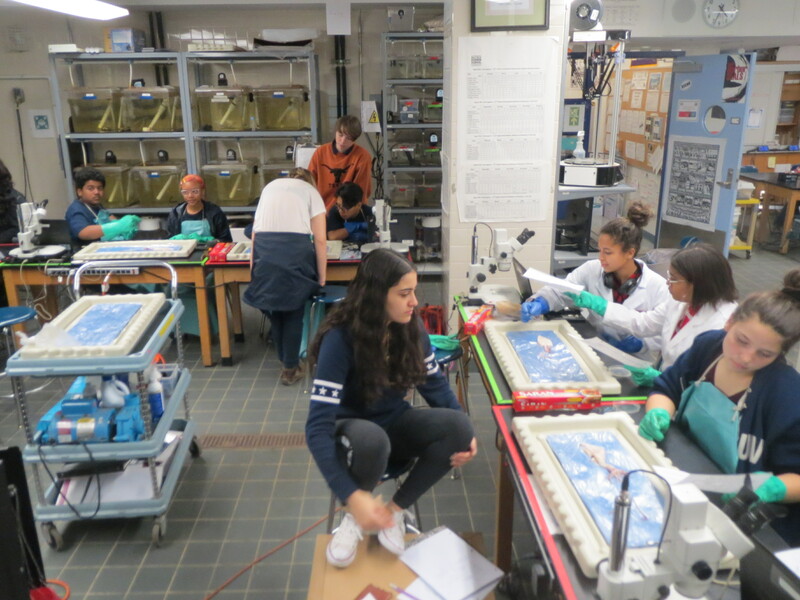 One of the most important objectives of the Marine Biology Research Program is to empower students to make a difference in their communities through the research they complete over a three year period. This year they were the stars of the CIVITAS Citizens benefit where philanthropists donated thousands of dollars to the cause of improving the Upper East and East Harlem neighborhoods during their annual benefit at Sothebys on the Upper East Side, NYC. Project Officers were the stars of the show at the 2017 CIVITAS Citizens benefit at Sothebys. ConEdison continues to be one of our most active Professional Advisory Committee members. 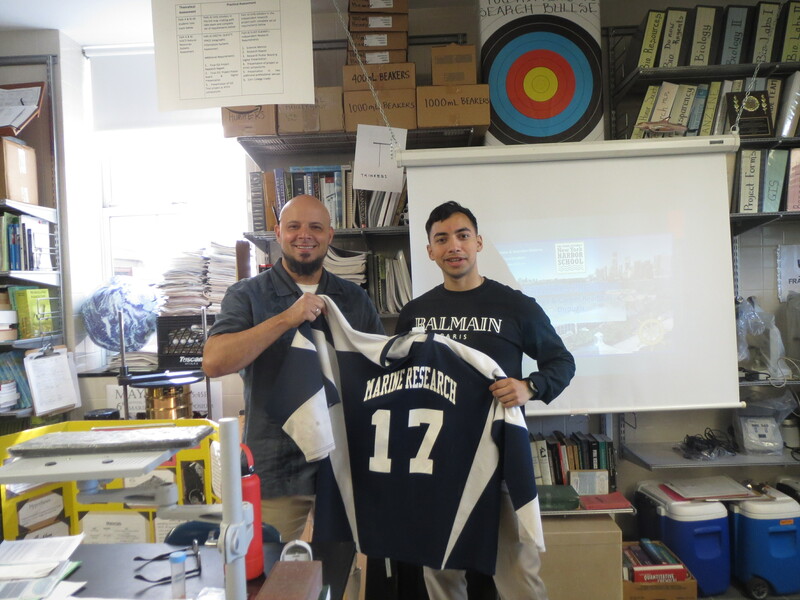 This semester they carried out a Career Management workshop where several of their star employees came to speak to our students about career readiness and opportunites at their company. They spoke about how many companies are willing to train students and even help to pay for their continuing education who meet a minimum of Transferable skills (i.e. team work, timeliness, problem solving), basic tool handling skills (i.e. knowing the difference between a Phillips and flat head screw driver to basic arithmetic and algebra), and who pass a basic entry level assessment. 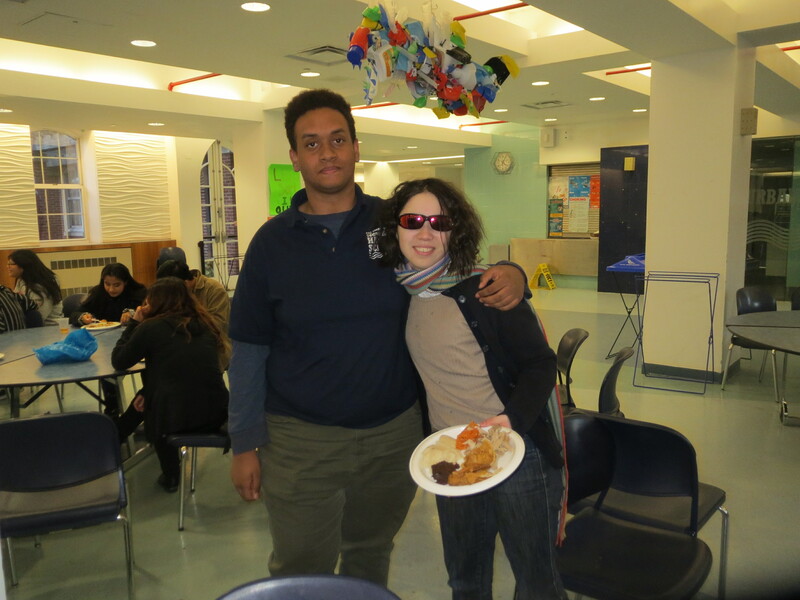 Industry partners ConEdison visit our scholars for a career development workshop. 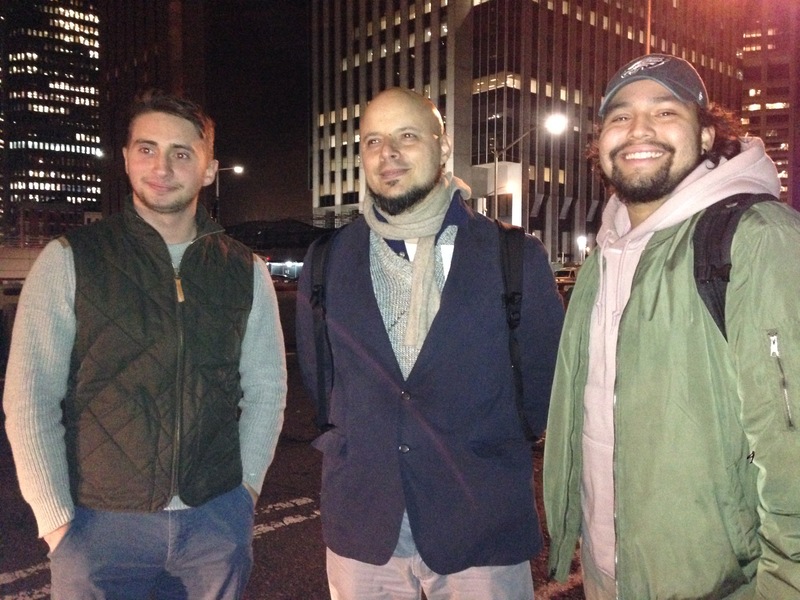 Among those attending from ConEd were Michael Porto & Michael, Kessler. Career readiness also requires a workforce that knows and fights for their rights. 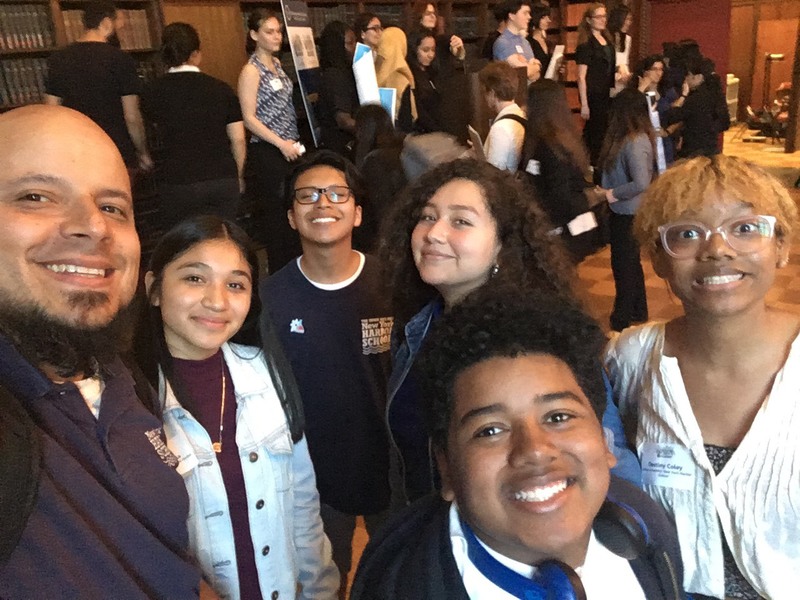 On April 22nd, our scholars planned a trip to Washington DC to march for Science. 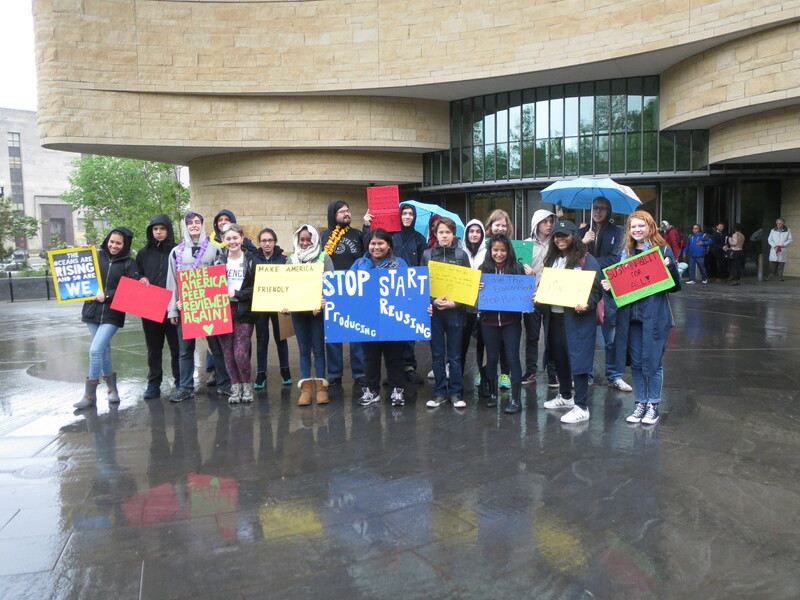 In today’s political climate where critical scientific evidence for climate change is being deleted from Federal databases and websites, our scholars weathered the rain with signs in hand and marched in front of the Washington Monument and the White House. On April 22nd MBRP scholars marched on Washington to protest the current administration’s deleting of scientific evidence on climate change reminiscent of the 1933 Nazi public burning of literature that went against the extreme nationalist ideology of the regime. Our after school Citizen Science team, the NYHS Harbor SEALs, has been hard at work monitoring the Hudson-Raritan Estuary. Most of the research that comes out of our lab is made possible by the effort and dedication of these young scholars. Typically composed of sophomores through seniors, this year we had a strong representation of freshmen who were stellar. 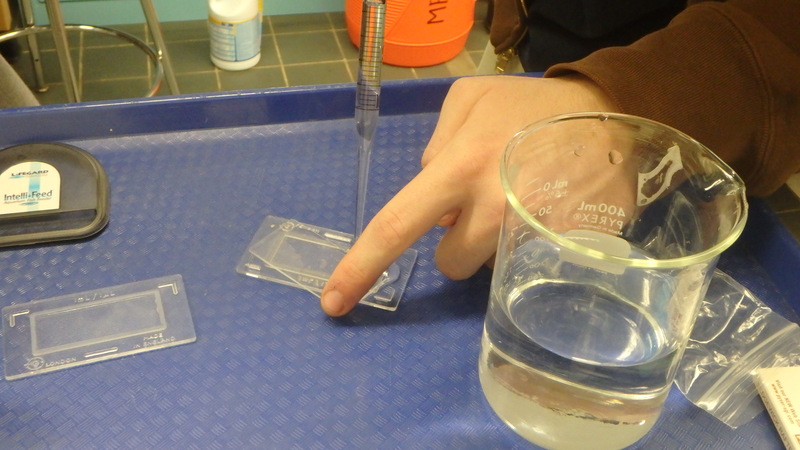 Jacqueline Obermayer worked with 10th grade research scholar Cyd Bloomfield using genetic barcoding techniques to determine the species richness of Buttermilk Channel. Jonah Florholmen Boum was an integral part of Team Phys-Chem and is a candidate for our Data Analyst position next school year. Maddie Dominguez has also been an integral part of Team Phys-Chem. 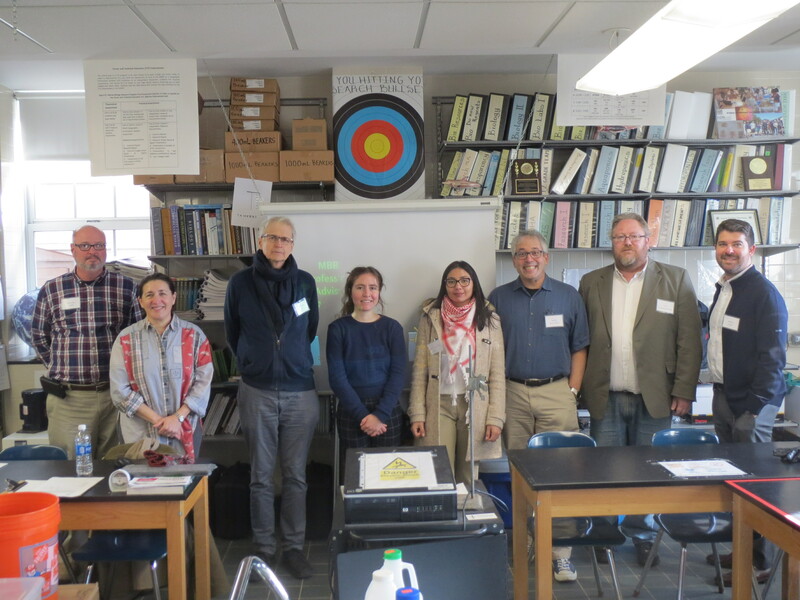 Last week, May 17, we celebrated our 6th Annual Marine Science Symposium at the New York Harbor School. We had over 45 projects on display and over 30 volunteers from various industry and post-secondary institutions help judge. 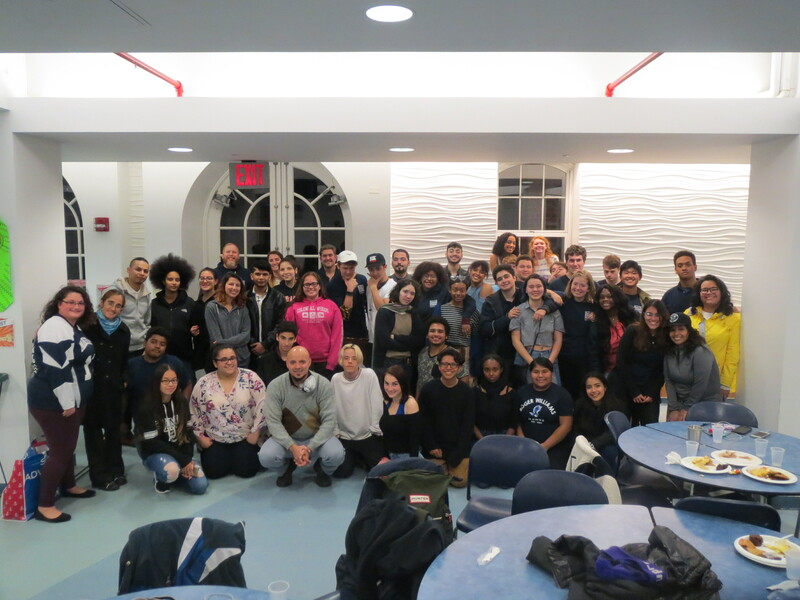 The highlight this year was the large number of volunteers who were former NYHS-MBRP alumni. Click here to view the Symposium Booklet with the complete list of volunteers, senior autobiographies, project titles, and Symposium results. 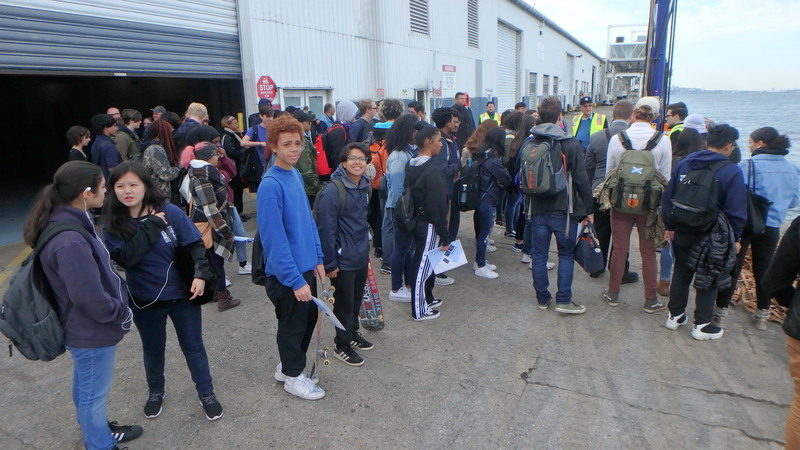 Go New York Harbor School Marine Science! Our 2017 Marine Biology Research Community. 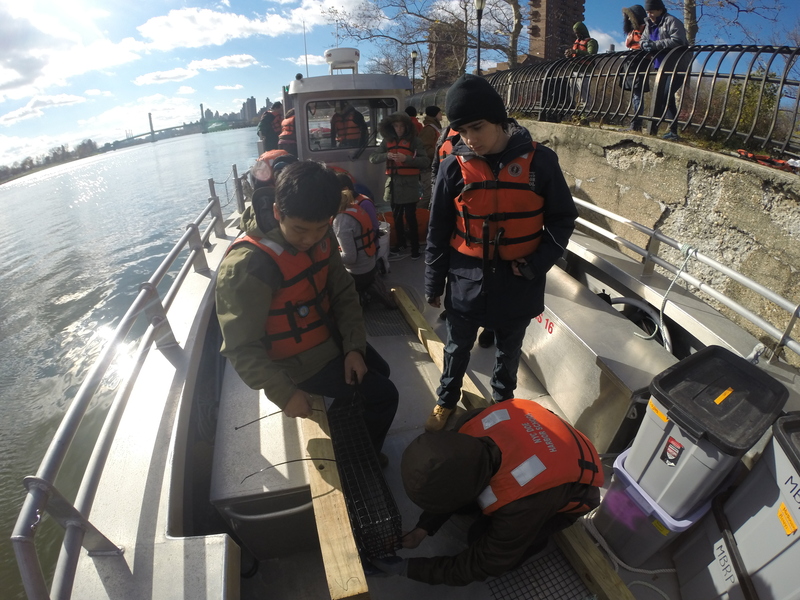 MBRP scholars deploying an experiment on the Harlem River for the non-profit group CIVITAS Citizens aboard the NYHF vessel, Virginia. Real-World experiences give scholars the opportunity to practice the technical and professional skills they learn in the MBRP (Photo Credit: Mauricio González). 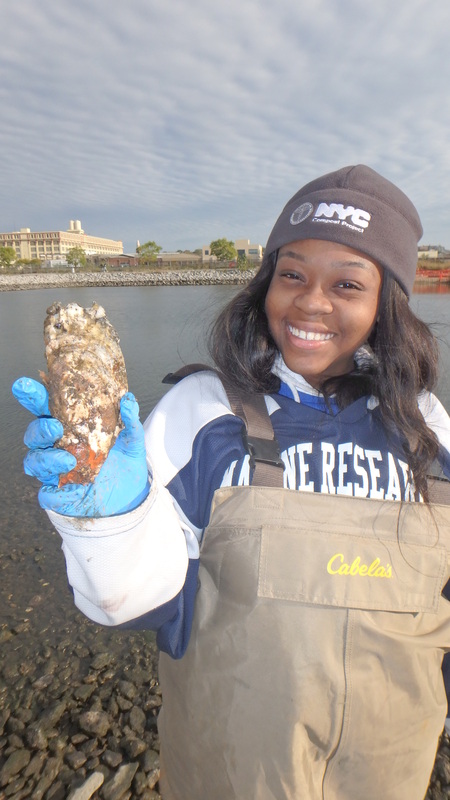 The New York Harbor School’s Marine Biology Research Program (MBRP) provides Work-Based Learning (WBL) experiences to its students in the 10 through 12th grades. WBL gives our marine scholars opportunities to study complex subject matter as well as gain vital workplace skills in a hands-on environment. 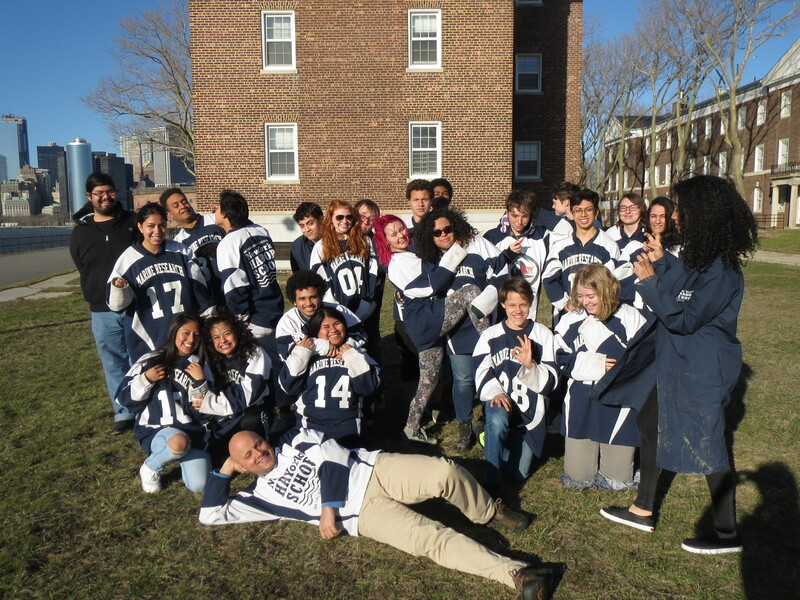 WBL experiences also provide students with career awareness, career options exploration, appropriate workplace skills development, and the opportunity to relate academic skills to real-life applications. For more information take a look at our 2016 MBRP annual report. 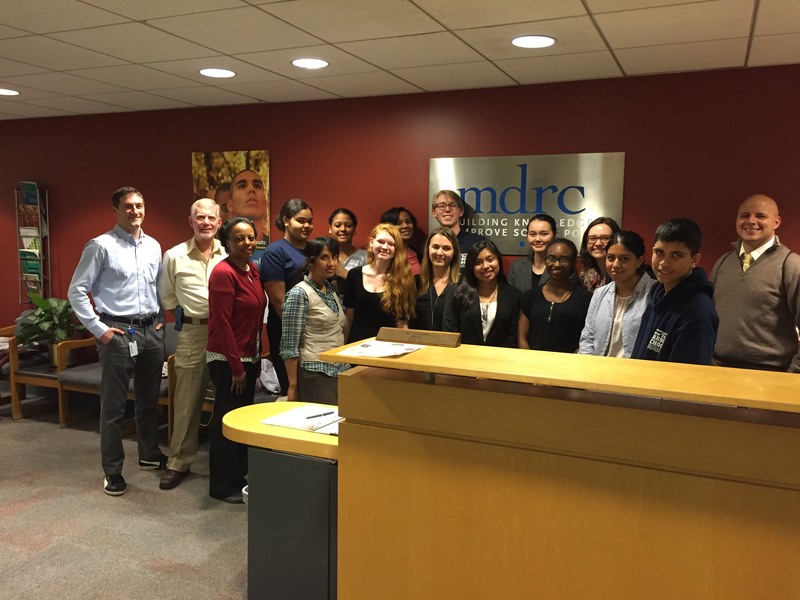 MBRP scholars visit the premiere sociology research organization mdrc where they get to participate in a mock research experiment. Work site visits allow scholars to feel they have access and fit in to places they would otherwise feel are inaccessible. Some WBL activities appropriate for every grade level are: guest speaker visits to the classroom, career fairs, job site tours, job shadowing, work with professional mentors on research projects, and internships. Internships are considered the pinnacle of the WBL spectrum. 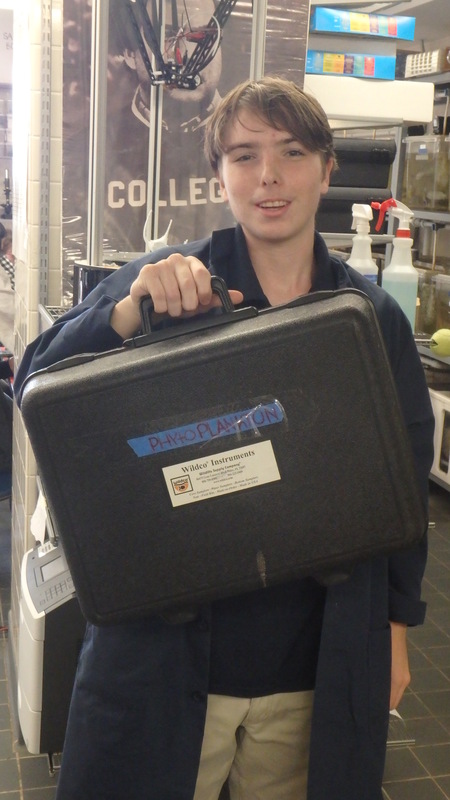 As students see the connections between their lab/field work and what is required at the work site, they gain an understanding of the importance of learning and are able to make better decisions about their futures. 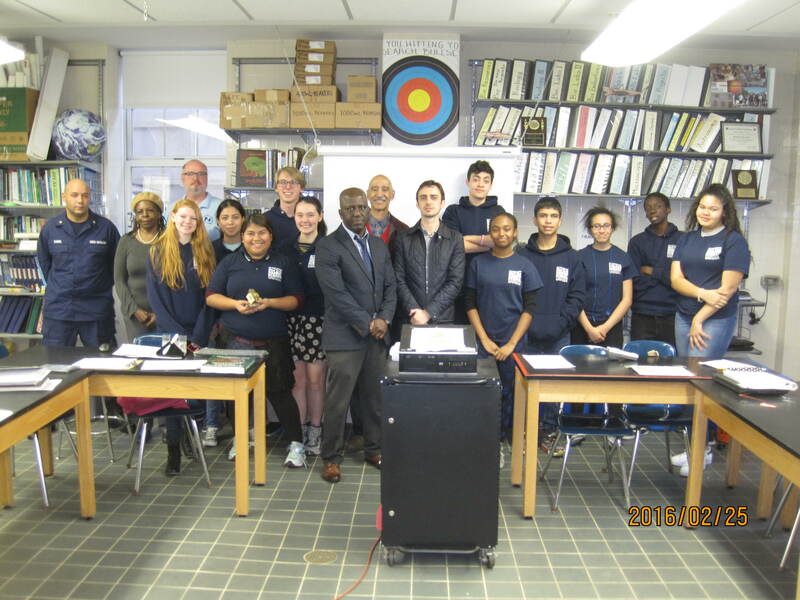 Professional visits by Mr. Michael Kessler from ConEdison. 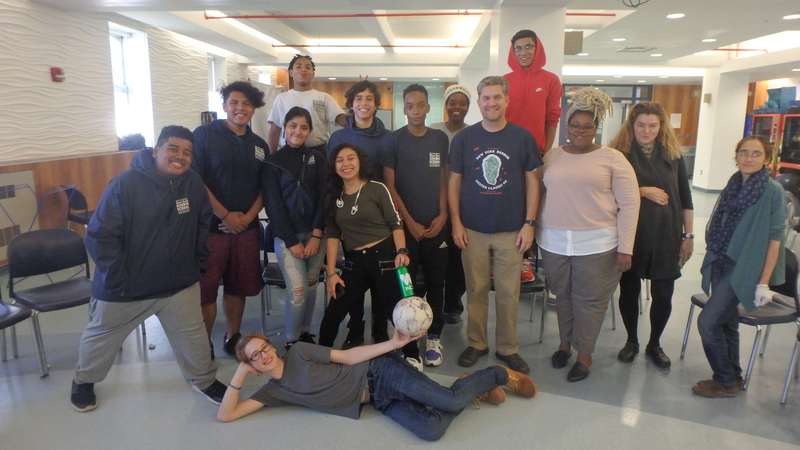 He invited a team from the Coast Guard Auxiliary and Dr. Neal Phillip from Bronx Community College to help instill the values of a good work ethic and striving for the top (Photo Credit: Mauricio González). Some of our yearly professional visits include Mr. Michael Kessler from the Consolidated Edison Corporation of NY (CON-ED), Capt. Matthew Leahey from the Coast Guard Auxiliary, and Mrs. Rachael Miller from the Rozalia Project. Our year wouldn’t be the same without the dedication of these professionals to making not only our scholars into better professionals but also improving the world around us. The MBRP has produced over 1989 Work-Based Learning opportunities for its students in the last 5 years. 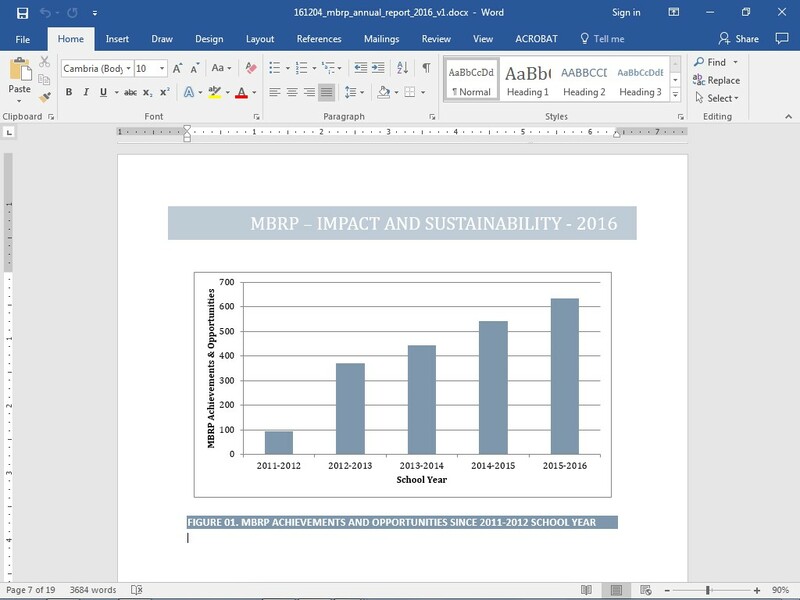 Every year has been better than the previous (Data: 2016 MBRP Annual Report). Since 2012, the MBRP has helped scholars access over eighty-eight (88) paid internships, seventy-five (75) service learning opportunities, four hundred twenty-three (423) professional visits, forty (40) scholar presentations in conferences, and twenty-five (25) work-site tours. Scholars have also had the opportunity to generate over twenty-eight (28) ePortfolios and forty-four (44) Work-Skills Employability Profiles. For more information take a look at our 2016 MBRP annual report. 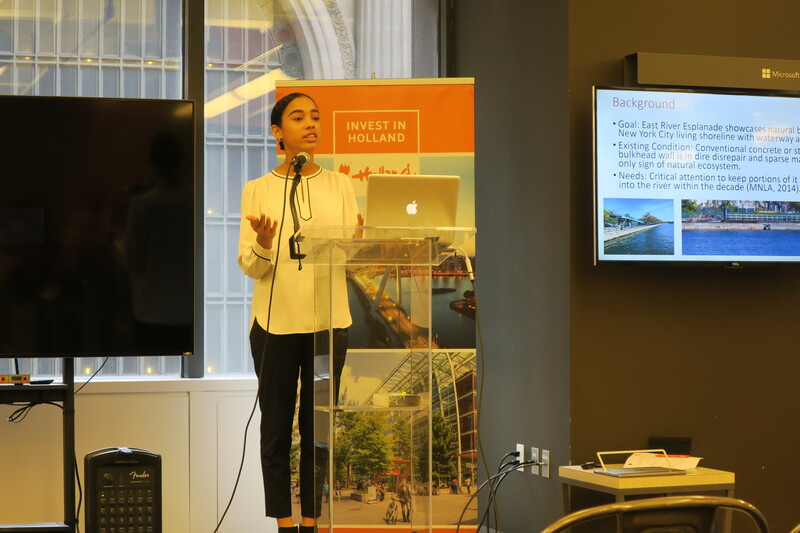 Some of our internships partners include CIVITAS Citizens, Cell Motion Labs, Earth Matter, The Nature Conservancy, The River Project, NYU, St. Francis College, Roger Williams University, and Columbia University. 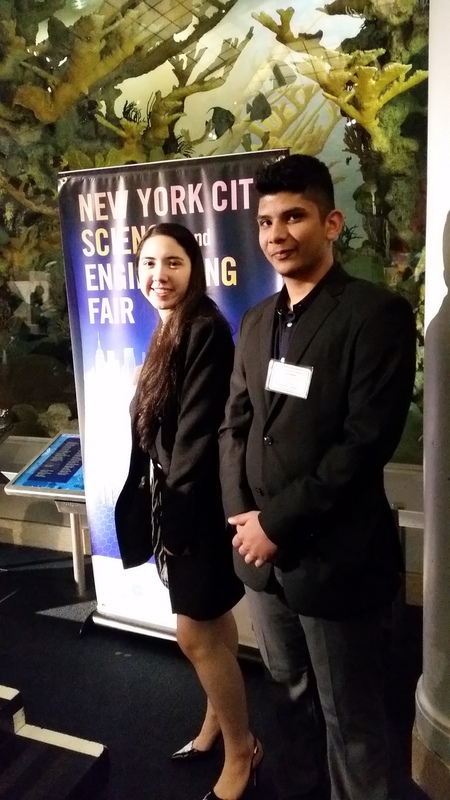 Cézanne Bies and Zain Bin Khalid present at the Finals round of the NYC Science and Engineering Fair. They eventually went on to win 3rd prize. 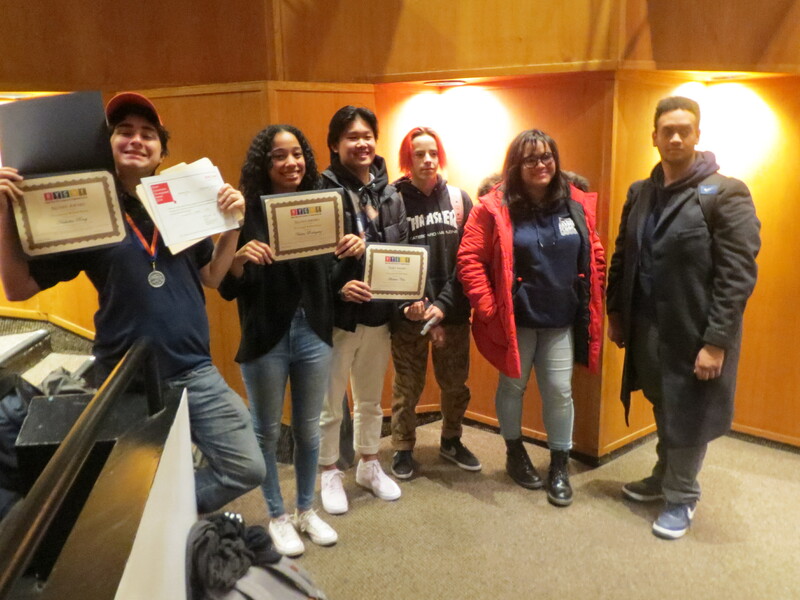 Professional presentations give scholars the experience needed to gain self-confidence in public speaking (Photo Credit: Ms. Ronnie Woodhouse). September 17. Melanie Smith, our Senior Project Manager (10 o’clock), Grace Carter & Cindy Isidoro, our Senior Operations Analysts, and the Harbor SEALs team organizing their first data collection day of the 2016-2017 season. Welcome back to the 2016 – 2017 research season! 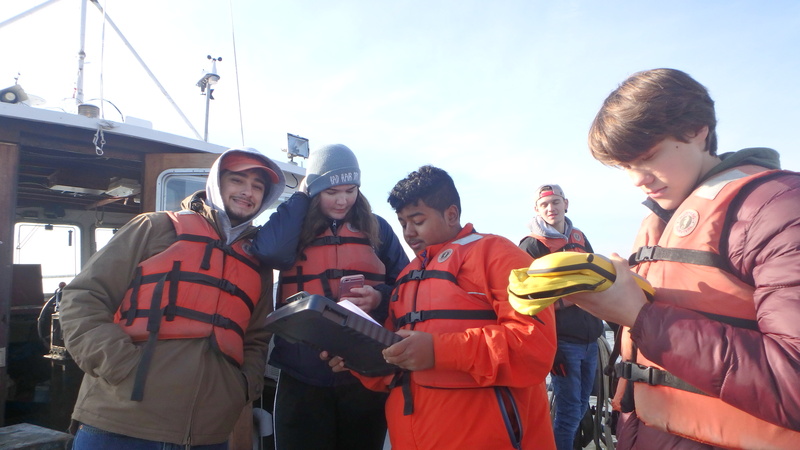 Here, at the Career and Technical Education (CTE) Marine Biology Research (MBRP) & Harbor SEALs programs, our budding scientists have started the year picking up where they left off last – In full NY Harbor data collection, data analysis, and restoration mode. 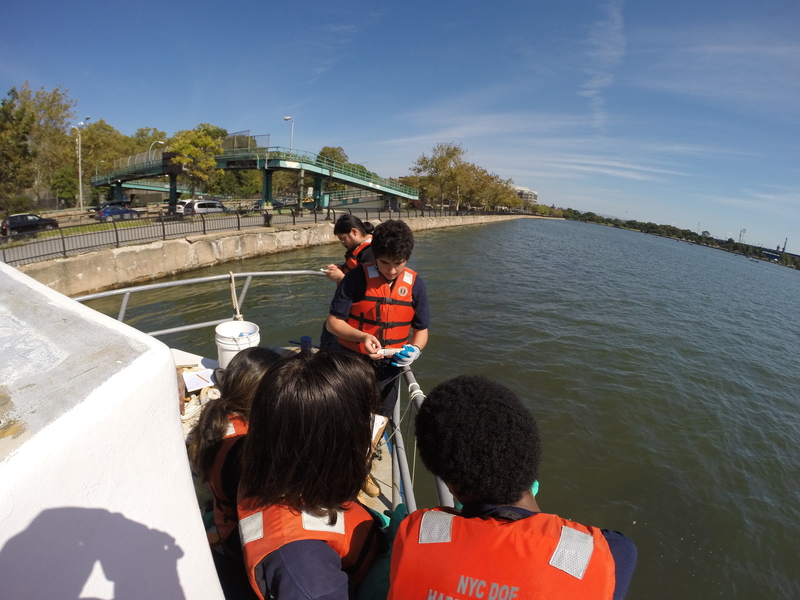 Our professional young SEALs scholars are finishing up their year long characterization of the Harlem River, a project designed to inform local government agencies of the environmental status of the Harlem River. 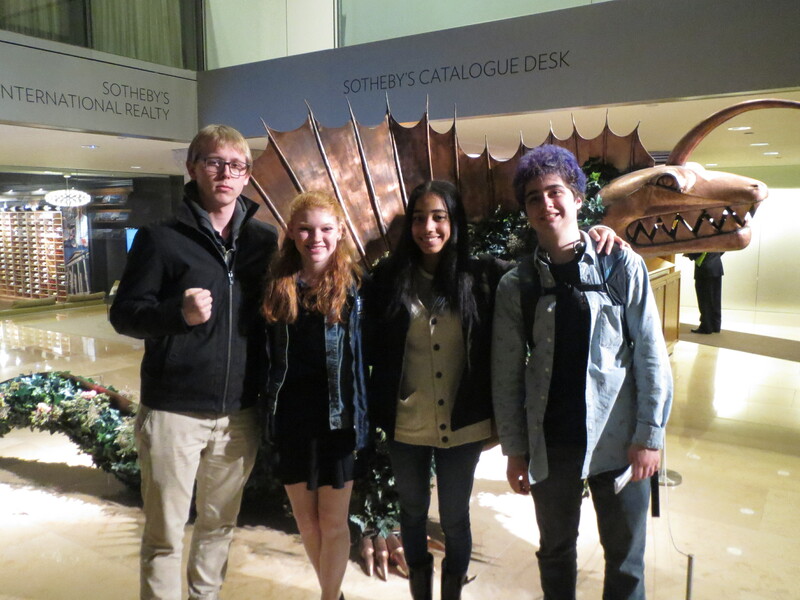 The Benthos and Biodiversity Teams: (L to R) Isabella Torres (Biodiversity Captain), Marcus Charles (Benthos Captain), Grace Carter (Senior Co-Operations Analyst), and Cindy Isidoro (Senior Co-Operations Analyst). In this figure, they’ve pulled up an Eckman grab with a sample of good old NY muck to see if anything can indeed live in it and what these organisms may indicate of the health of the River. 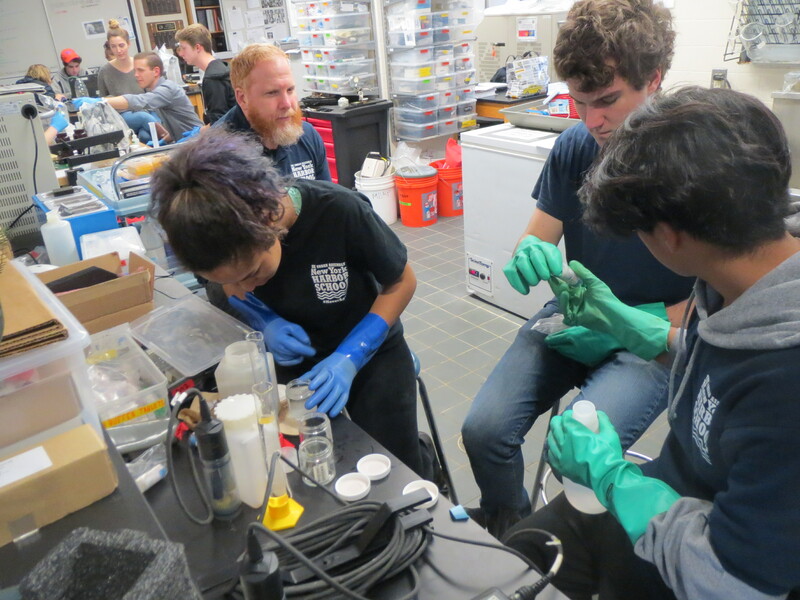 The Phys-Chem and Plankton Teams: In the background, Nicholas Ring (Junior Project Manager) heads up the testing of the physical and chemical parameters of the River. 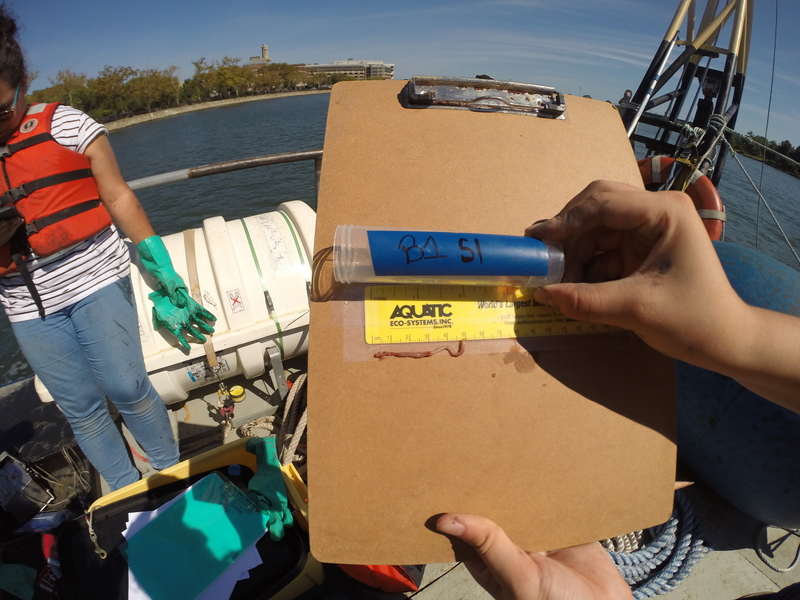 During this sampling run he observed that the dissolved oxygen was hovering around 5mg/L which is the first dangerous tolerance marker for most marine organisms. Right below this level, organisms stop reproducing. These levels are characteristic of most of the Harbor where sea walls are located due to their anti-life characteristics, close to the muck that receives all the CSO effluents, and in September when the water temperature is typically at its apex. 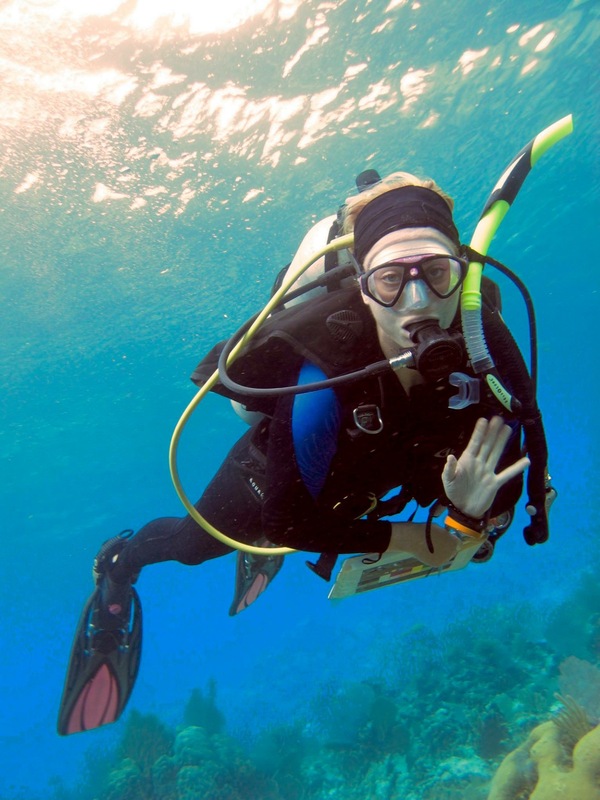 This year, the Marine Biology Research Program is offering its students up to 18 college credits upon successful completion of the Program’s curriculum and assessments. In today’s economy, students need to be college AND career ready. The MBRP offers a 12 college credit program in Science Research through SUNY Albany, 3 college credits for passing the NOCTI Natural Resources Systems exam, and, new this year, 3 college credits for Oceanography through SUNY Stony Brook. 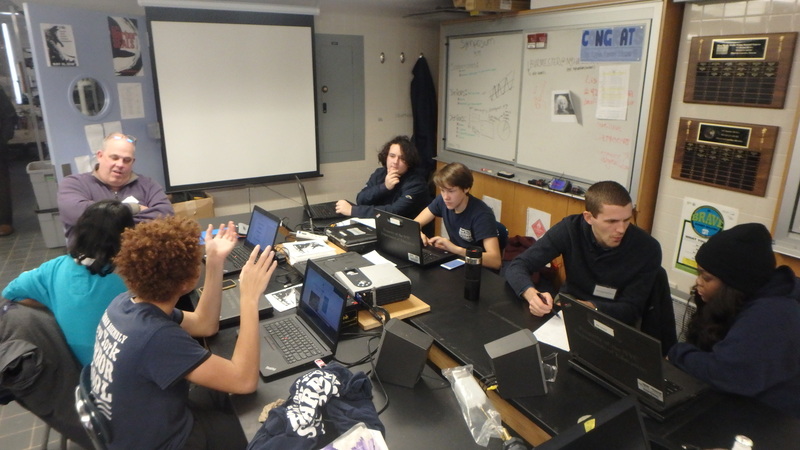 Apart from these wonderful opportunities, our high school students will also have the chance, for the first time in NY State, to complete and become certified in Geographic Information Systems through Digital Quest’s SPACE certification. Last season, our CTE internship SEA WORKS program paid out over 50,000 dollars in salary for students’ work throughout their different CTE programs of which CIVITAS was a major internship provider for our MBRP scholars. Polychaeta worms are often found in the muck where dissolved oxygen levels are low. Lastly, our Professional Advisory Committee member Mr. Michael Kessler from ConEdison has been supporting the MBRP and other CTE programs by helping to create a pipeline into technical jobs right out of our High School, the New York Harbor School, to give our young scholars options to enter the world of work with high paying, stable jobs of the future. A big thanks to all our Professional Advisory Committee members for stepping up to the plate and leading our school community members and the MBRP into a year brimming with exciting opportunities. Mudsnails are also frequent inhabitants of the River’s benthos. 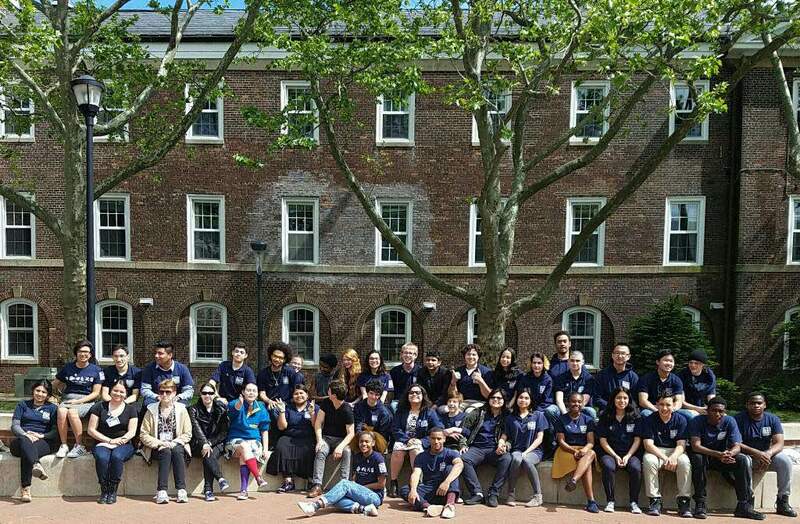 Greetings Marine Biology Research Program (MBRP) scholars, Professional Advisory Committee members, New York Harbor School Staff, Family, and Friends! Thank you again for making the 5th Annual Harbor School Symposium a success. It was especially heartfelt since the director of the event could not be there due to personal circumstances. All the Marine Research scholars, volunteers, guests, guardians, and staff members stepped up to make the night’s events run smoothly. The leadership and teamwork are a testament to the dedication and maturity of all those associated to the MBRP. Click here to view the Symposium results and booklet. 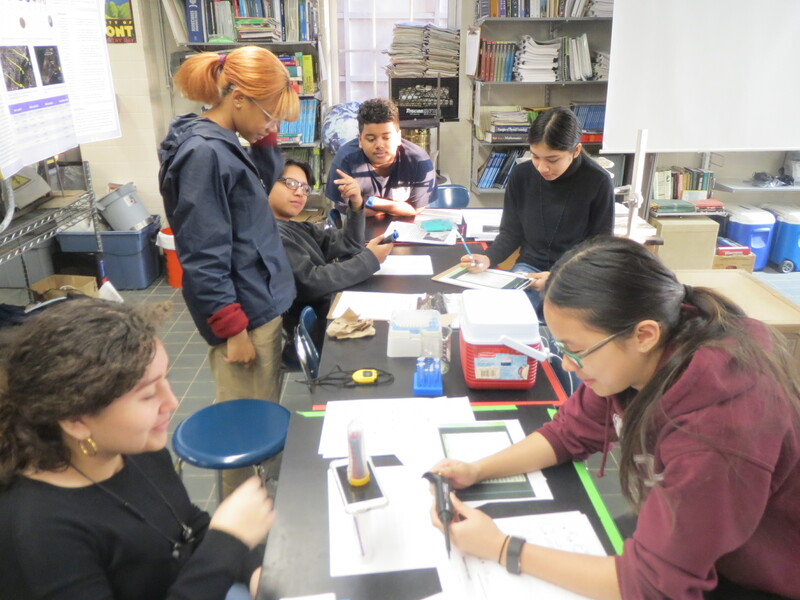 Go New York Harbor School Science! You’re cordially invited to attend our 5th Annual Marine Science Symposium at the New York Harbor School on May 18 starting at 12pm. Experience cutting edge science from our very own Marine Biology Research Scholars and our special guest Mr. Charlie Fitzpatrick, ESRI Schools Program Manager. Mr. Fitzpatrick will be sharing his journey through the exciting world of Geospatial technology. 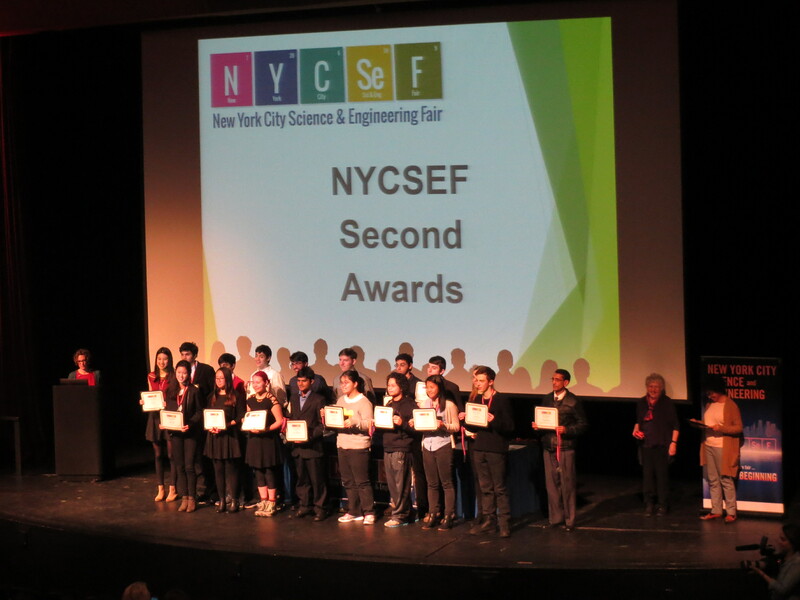 Also presenting are this year’s NYC Science and Engineering Fair participants and finalists including Cezanne Bies and Zain Bin Khalid who received the third award among NYC’s top science scholars for their project on oyster restoration. Go New York Harbor School science!